© 2002, © 2018 by Paul Freeman. Revised 12/30/18. 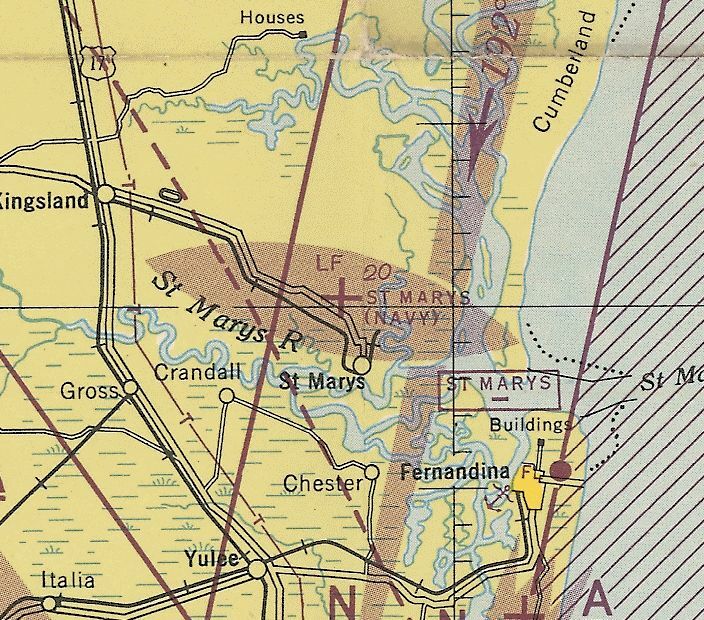 St Marys Airport, as depicted on the February 1945 Jacksonville Sectional Chart (courtesy of Ron Plante). According to its FAA Airport/Facility Directory data, this general aviation airport was activated in May 1941. 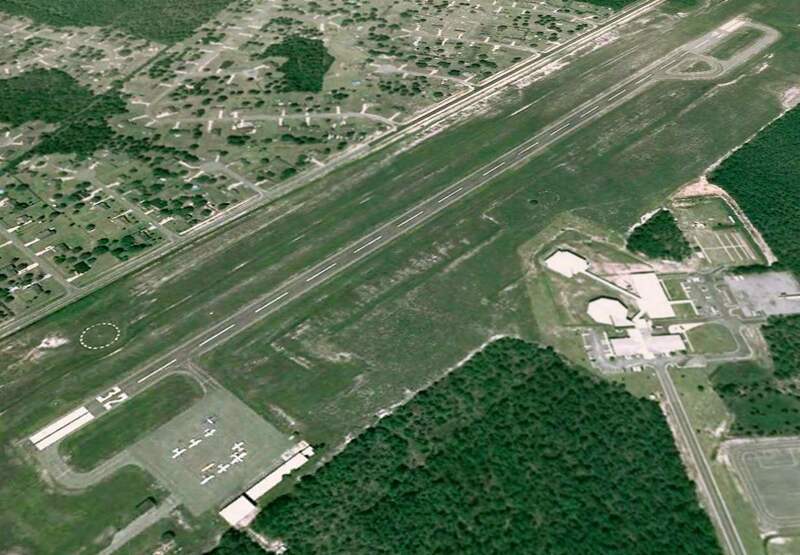 According to Brian Rehwinkel, “NAS Jacksonville began using the field [St Marys Airport] apparently in early 1942, before the paved runways were added in 1943. The Navy leased the field from the City of Saint Marys for $1/year. The Civil Aeronautics Administration (CAA) improved the field by adding the three 5,000’ runways. 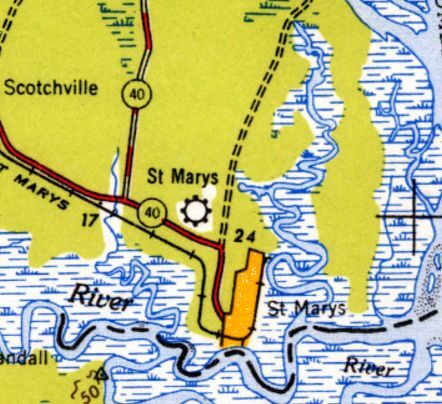 The earliest depiction which has been located of St Marys Airport was on the February 1945 Jacksonville Sectional Chart (courtesy of Ron Plante). It depicted “St Marys (Navy)” as an auxiliary airfield. showing the field while it was being used as a Navy Outlying Field. 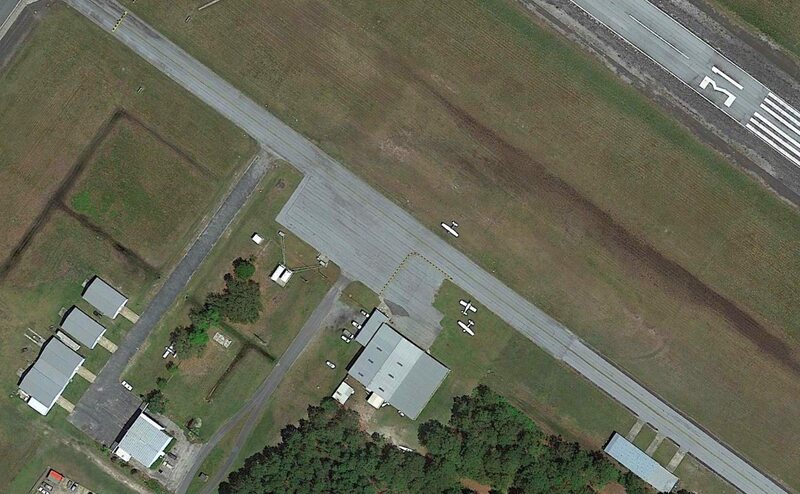 It showed St Marys to have 4 paved runways & a parallel taxiway, but no ramps, hangars, or other improvements. According to Brian Rehwinkel, “The lease was apparently cancelled sometime in late 1945 or early 1946 & the 462 acre airfield was returned the City of Saint Marys. 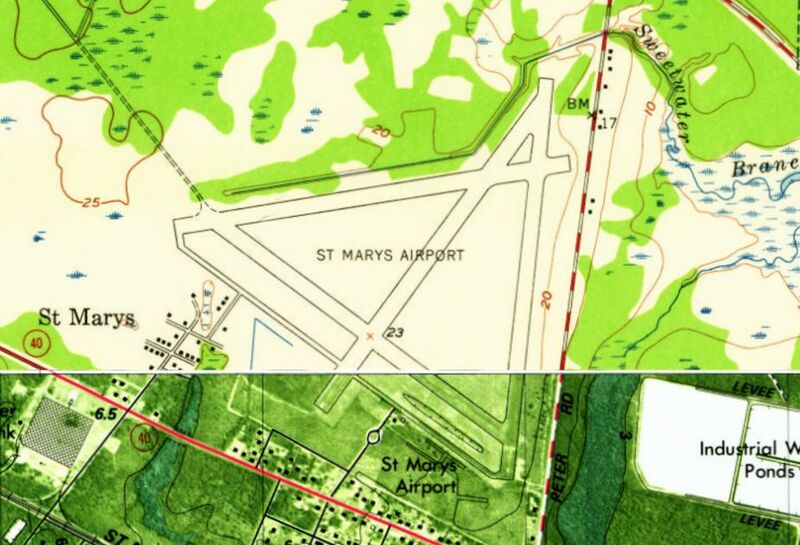 The earliest topo map depiction which has been located of St Marys Airport was on the 1948 USGS topo map. 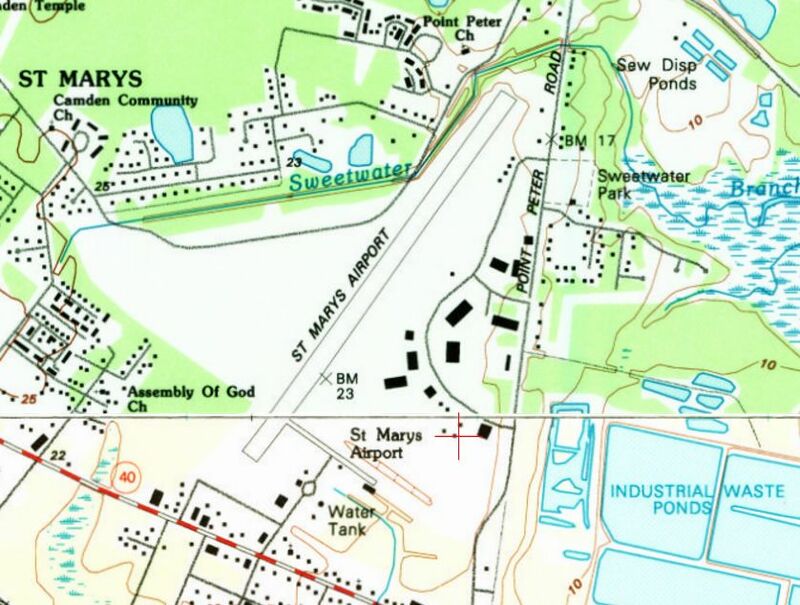 The 1958 USGS topo map depicted St Marys Airport as having the layout of 4 paved runways which was characteristic of many US airfields built during WW2. A taxiway led to 2 small buildings on the south side of the airfield. 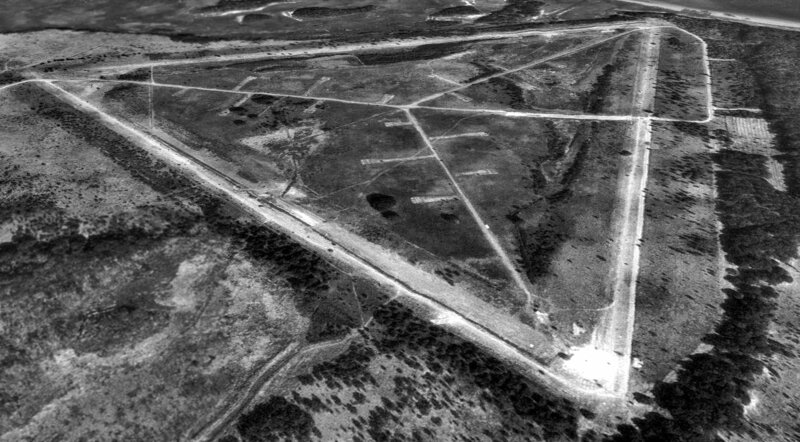 A 1988 USGS aerial view looking north at St Marys Airport showed that 3 of the runways had been abandoned at some point between 1958-88, leaving only Runway 4/22. A half-dozen light single-engine aircraft were visible parked on the south side of the airfield, along with a few small hangars. with only a single northeast/southwest runway. 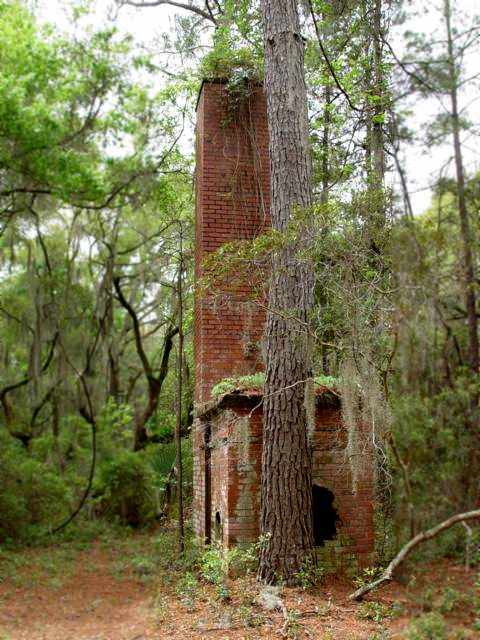 as a result of its position approximately 1 mile south of Naval Submarine Base Kings Bay. The Federal Aviation Administration created a Temporary Flight Restriction below 5,000' & a radius of 5 miles from the base, effectively eliminating all [air] traffic. Aircraft based at that field were eventually allowed to leave under special permission of air traffic control, but the existing Fixed-Base Operator suffered substantial financial difficulties during this time. The airport was reopened on 12/3/01, with the creation of a smaller Temporary Flight Restriction located approximately ½ mile from the departure end of Runway 4.
the Navy pressed for a permanent closure of the airport for national security reasons. As a result, in April 2004 the city received a grant of $236,538 from the Department of Transportation for an airport relocation study. Nine possible sites were studied by Reynolds, Smith and Hills, a contracted consultant, with a final site approved on 2/17/05. 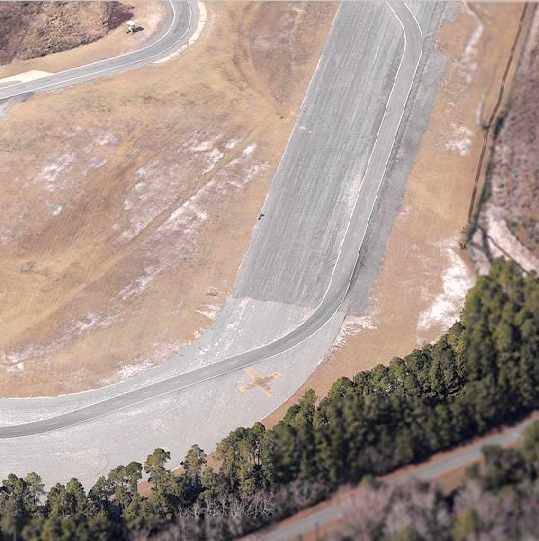 The new airport location will be south of Woodbine, GA. The anticipated cost is $29 million, with 90% of the construction costs paid by the Department of Transportation. The approval for the airport was not without controversy. In February 2007, the St. Marys City Council & the St. Marys Airport Authority entered disputes over both airport ownership & whether the airport should even be moved. This eventually led to litigation. On 10/2/08, the court ruled that the city & not the airport authority had legal control over the property, allowing the move to proceed. The current estimated costs are now over $40 million. There had been no written document from the Navy (or any other official governmental body) that requested either the closure or relocation of St. Marys Airport until September 2012. This was due to concerns involving skydivers accidentally landing on Naval Submarine Base Kings Bay. A 2016 aerial view looking north showed that St Marys Airport regained a 2nd runway (Runway 13/31) at some point between 1994-2016. A 2016 aerial view showed 4 light single-engine aircraft parked near some small hangars on the south side of St Marys Airport. The FAA Airport/Facility Directory said St Marys Airport conducted an average of 77 takeoffs or landings per week in 2014.
with the Manager listed as John Holman. 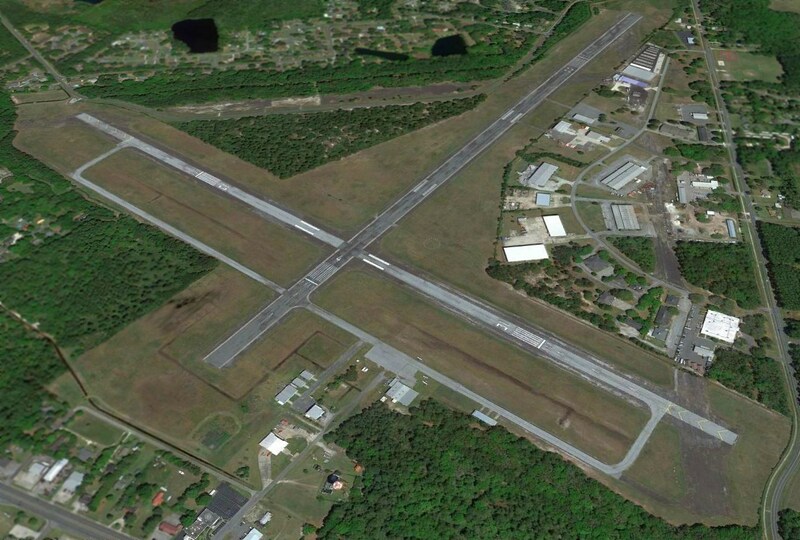 It was said to have 2 asphalt runways: 5,021' Runway 4/22 & 4,001' Runway 13/31. It was said to have 26 based aircraft, including 1 multi-engine. 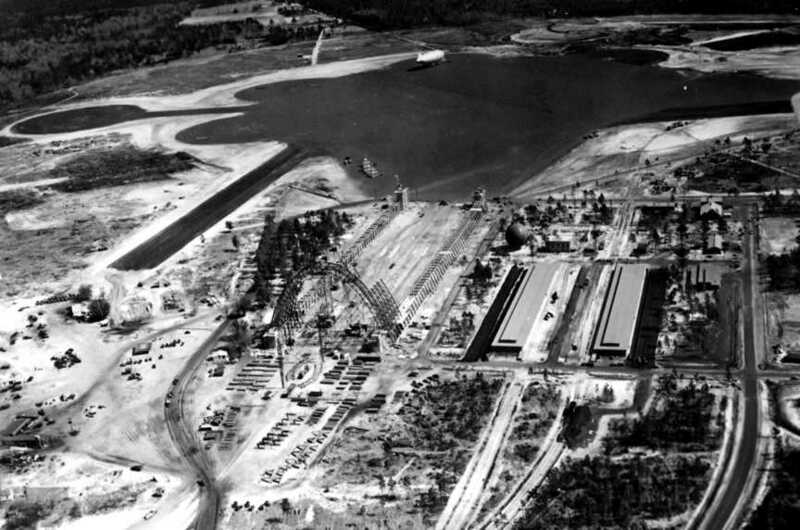 one of which was pointed directly at King's Bay Submarine Base's Prohibited Area P-50, the eventual reason for the airport's demise. 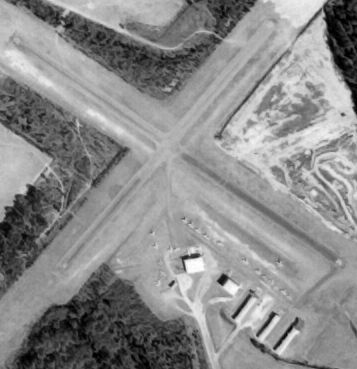 St Marys Airport is located north of the intersection of Osborne Street & North Dandy Street. Thanks to Ron Plante for pointing out the closure of this airport. 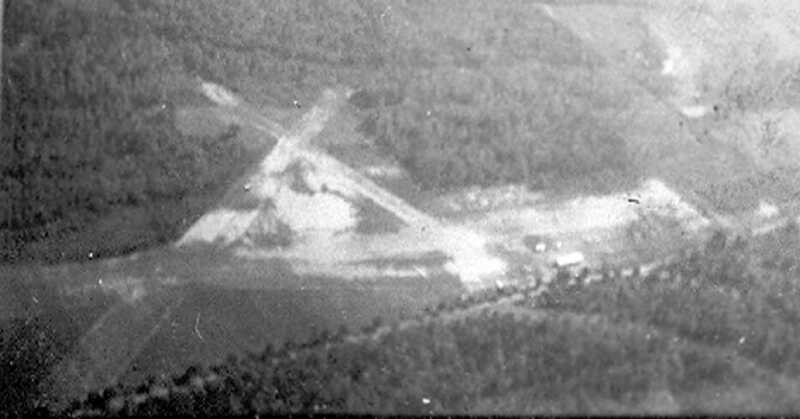 Liberty County Airport, as depicted on a 5/1/68 USGS aerial photo (courtesy of Oliver Dallam-Lee). as it was not yet depicted on the October 1968 Jacksonville Sectional Chart. was on a 5/1/68 USGS aerial photo (courtesy of Oliver Dallam-Lee). but not other specific airfield features. with a small ramp with 2 small buildings on the southeast side. 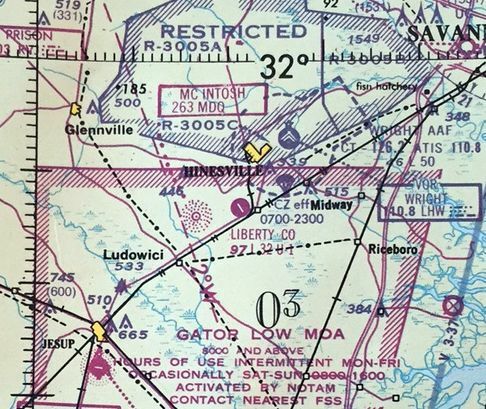 The earliest aeronautical chart depiction which has been located of the Liberty County Airport was on the 1978-79 GA Aeronautical Chart (courtesy of David Stevenson). 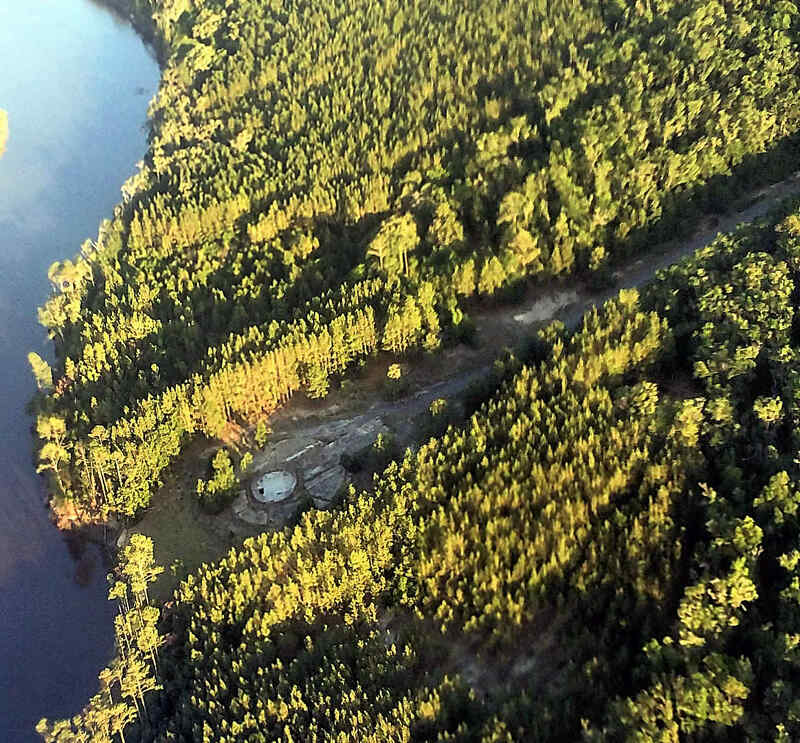 It depicted Liberty County as having a single 3,200' paved runway. 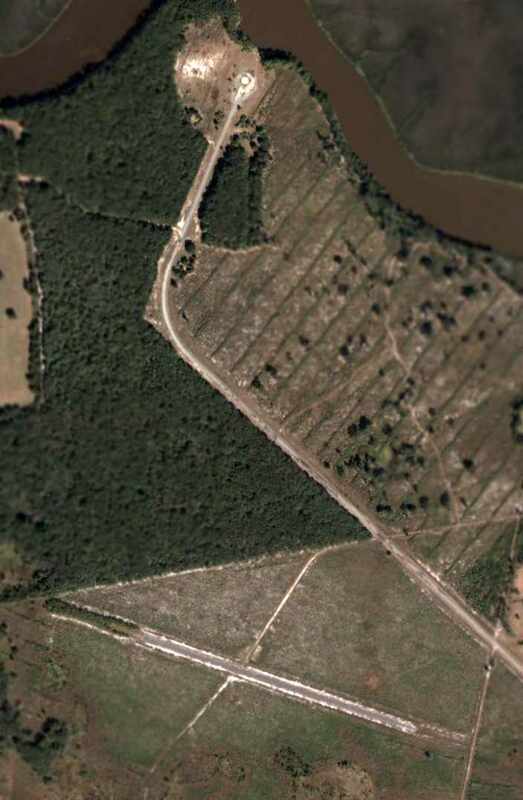 A 3/5/87 USGS aerial photo (courtesy of Oliver Dallam-Lee) depicted a dozen light aircraft on the Liberty County ramp. 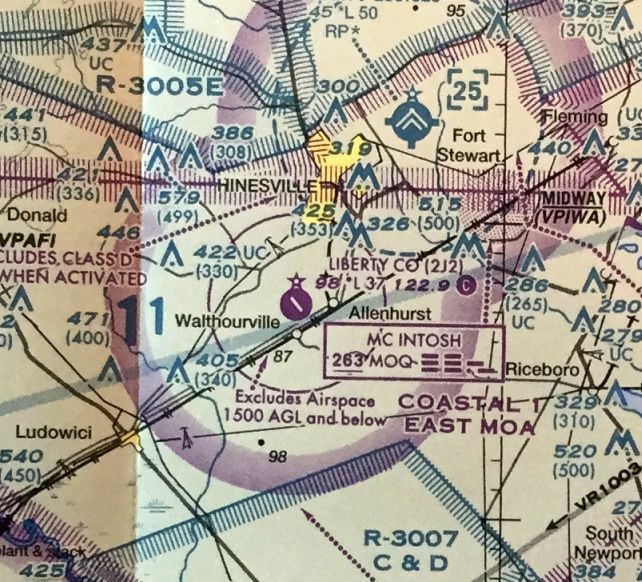 The March 1994 Jacksonville Sectional Chart (courtesy of Ron Plante) depicted Liberty County as having a 3,700' paved northwest/southeast runway. which depicted a total of 9 light aircraft parked on its ramp. described the field as having a single 3,698' asphalt Runway 14/32, in “fair” condition. 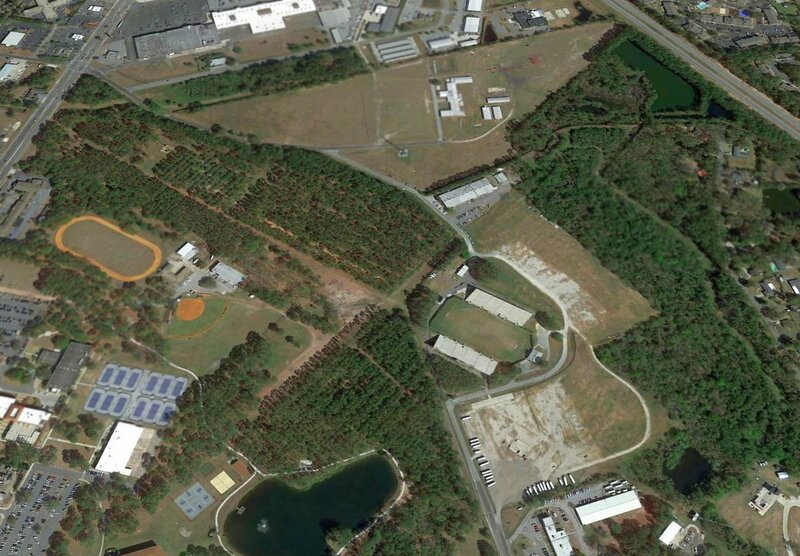 The field was owned by Liberty County, and the manager was Joseph Brown. and it was listed as conducting a total of 77 takeoffs or landings per week. becoming known as the Midcoast Regional Airport. A 2008 photo by Thomas Wahl of a hangar foundation & the airport beacon. A 2008 photo by Thomas Wahl looking northwest along the closed Runway 32. 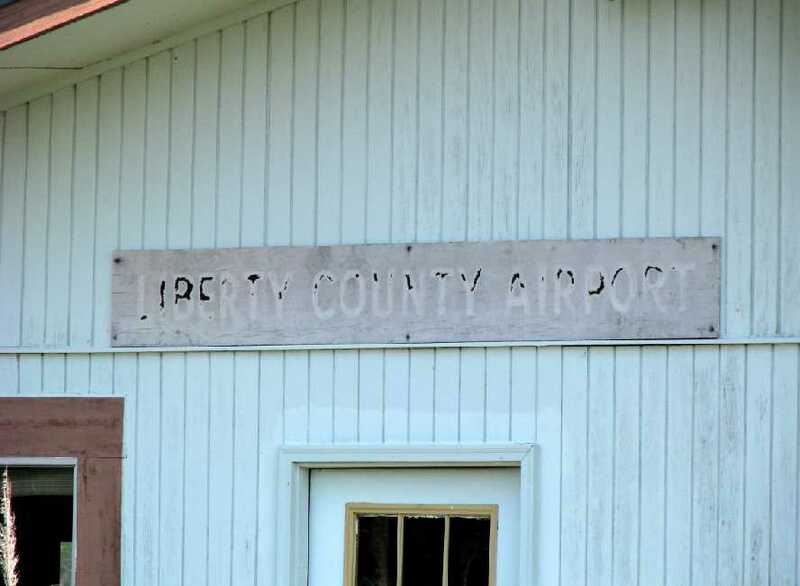 A 2008 photo by Thomas Wahl of a “Liberty County Airport” sign on the FBO building. A 2008 photo by Thomas Wahl of the former FBO building. 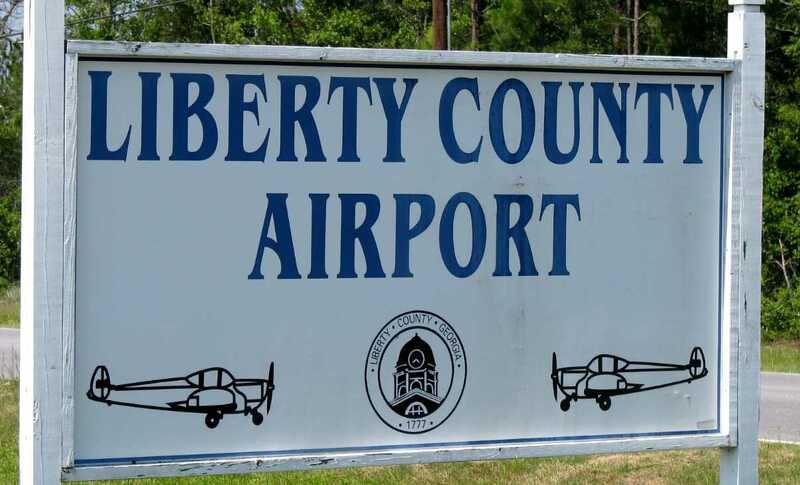 A 2008 photo by Thomas Wahl of a sign for the Liberty County Airport. 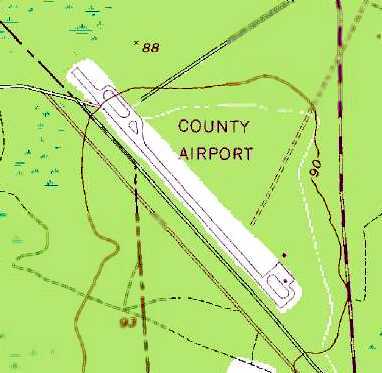 Even though it had been closed the year before, Liberty County Airport was still depicted on the 2009 Jacksonville Sectional Chart. 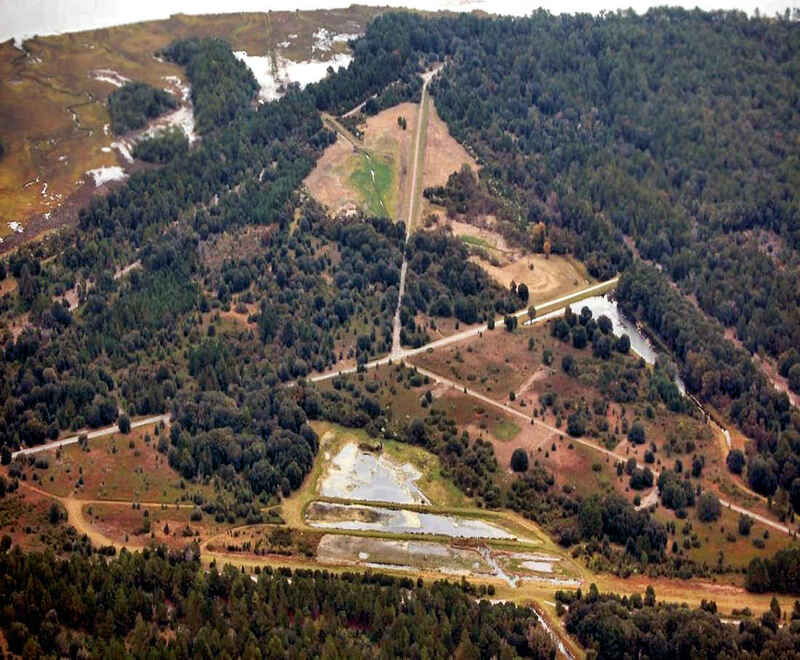 A 2013 aerial view looking west at the site of Liberty County Airport showed the runway & ramp remained intact, but the hangars had been removed. An 11/18/17 photo by Matt Franklin looking southeast along the former Liberty County Airport Runway 14.
and a local radio-controlled model aircraft club has erected some stands & uses the Runway 14 end for flying. An 11/18/17 photo by Matt Franklin looking southeast at the radio-controlled model aircraft shelter next to the former Liberty County Airport runway. 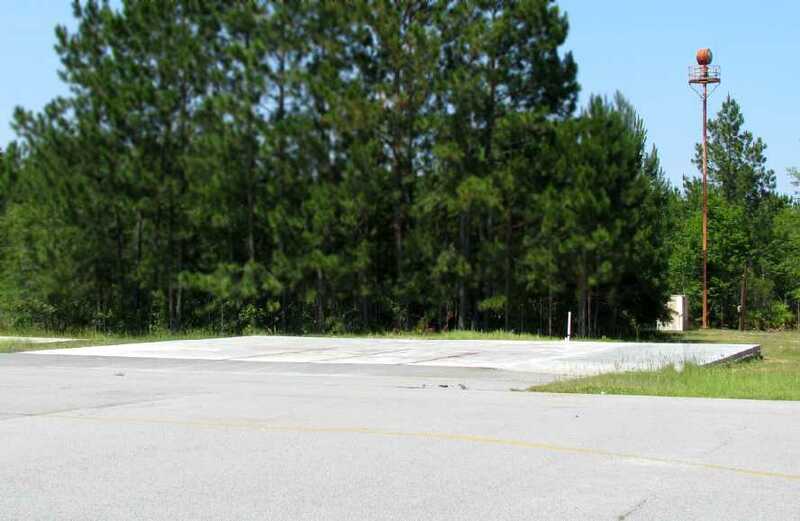 The site of Liberty County Airport is located northwest of the intersection of Dorsey Road & Slaten Drive. 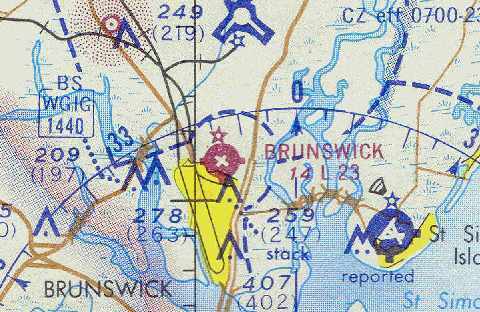 The original Brunswick Airport, as depicted on the February 1949 Jacksonville Sectional Chart (courtesy of Chris Kennedy). The original airport for the town of Brunswick was a small field located adjacent to the north side of the town. 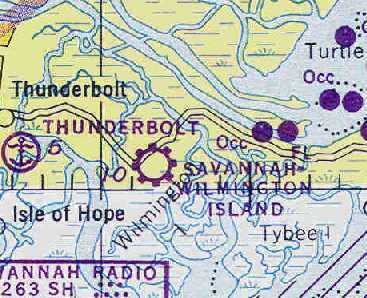 as it was not yet depicted on the August 1946 Jacksonville Sectional Chart. was on the February 1949 Jacksonville Sectional Chart (courtesy of Chris Kennedy). It depicted the field as having a 2,600' unpaved runway. with a taxiway leading to 2 hangars on the southeast side. with a taxiway leading to 3 hangars on the southeast side. 2,400' Runway 13/31 & 2,000' Runway 4/22. The field was described as offering major repairs, fuel, hangars, tiedowns, and charter. The operator was listed as Baker Flying Service. and he checked me out in his 7AC Champ & then let me fly anything that I felt like trying out. Aeronca 7AC ($6/hr), Piper Colt, Piper Tri Pacer, Piper J-3, Aeronca L16A (about $ 1.50/hr, only the cost of fuel as a member of CAP). But since, as a Marine PFC making about $86/month, this was still a lot of money. George Perry also took me for a couple of rides in his Twin Bonanza. I believe it is the furthest aircraft to the left in that picture of 5 twins. He also took me over to St. Simons Island for an open house & small airshow. 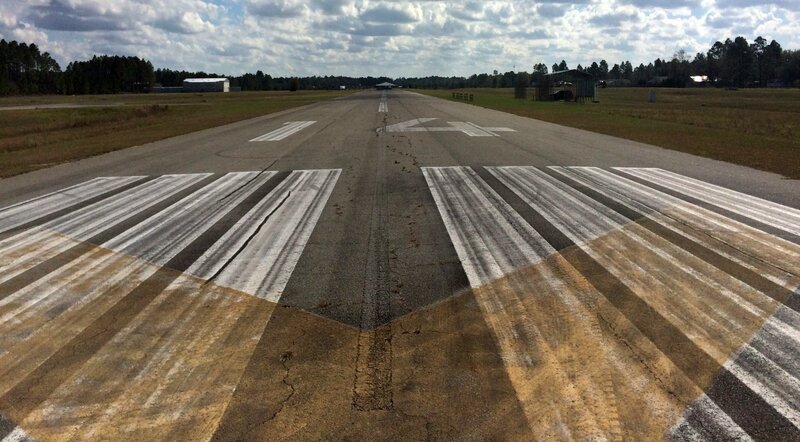 depicted the Brunswick Airport as having 2 paved runways: 2,350 Runway 13/31 & 1,900' Runway 4/22. The manager was listed as F.A. Baker. 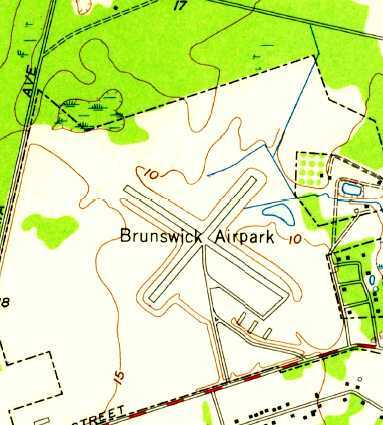 The 1968 Flight Guide (courtesy of Robert Levitttan) depicted the Brunswick Airport as having 2 paved runways: 2,350 Runway 13/31 & 1,900' Runway 4/22. 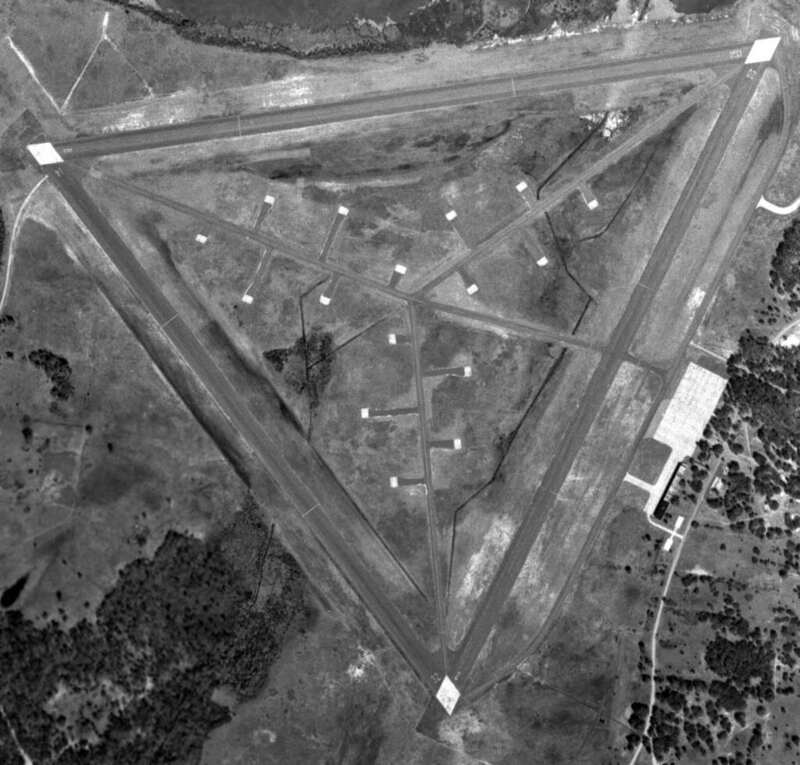 A circa 1960s aerial view of Brunswick Airport (courtesy of Jimmy Hamilton) showing 5 hangars & a number of light general aviation aircraft. A circa 1960s photo by Jimmy Hamilton of a Consolidated PB4Y-2 Privateer (in civilian use?) at Brunswick Airport. Sherman Swofford recalled, “I Glynco veteran (1968-69) that learned to fly from George Perry at the Brunswick Airport. 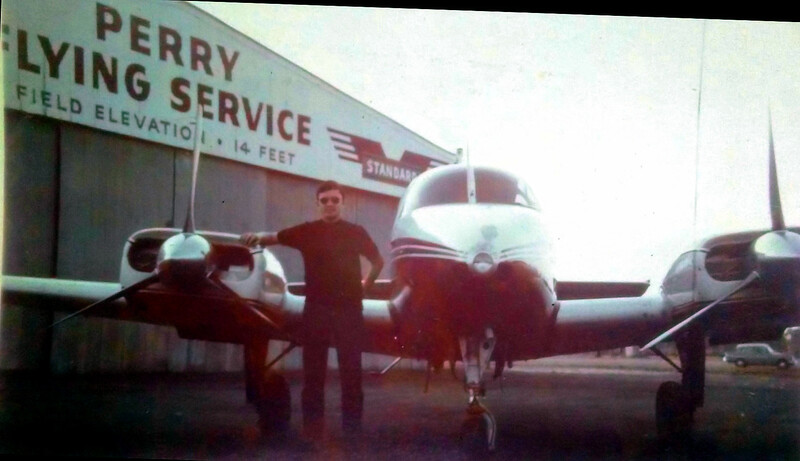 and also worked for George Perry, owner of Perry Flying Service, from 1969-75. A gracious & caring man to say the least. of 5 twin-engine planes in front of the hangar & office of Perry Flying Service at the Brunswick Airpark. 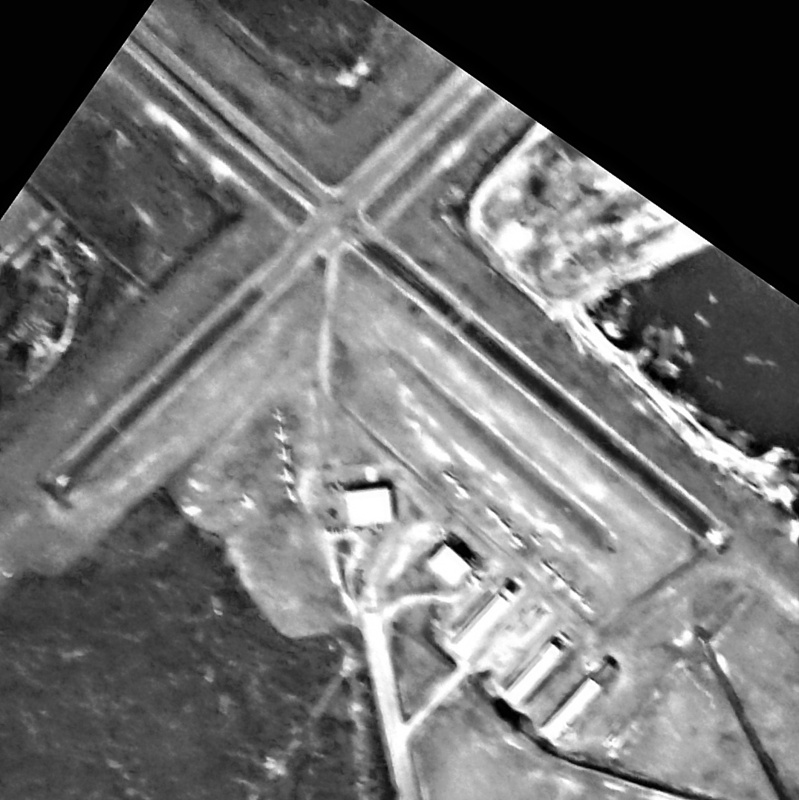 The last photo which has been located of the original Brunswick Airport was a 1974 USGS aerial photo (courtesy of David Henderson). It showed over a dozen light aircraft parked outside. was on the March 1974 Jacksonville Sectional Chart (courtesy of Chris Kennedy). It depicted Brunswick as having 2 paved runways, with the longest being 2,300'. as it was no longer depicted at all on the January 1976 CH-25 World Aeronautical Chart (according to Chris Kennedy). which had been closed by the Navy & relinquished for use as a civilian airport. but labeled the buildings along the west side of the former airport site as “Brunswick Junior College”. even though all of their pavement had been removed. a short section of taxiway pavement, along with a foundation & a paved ramp. 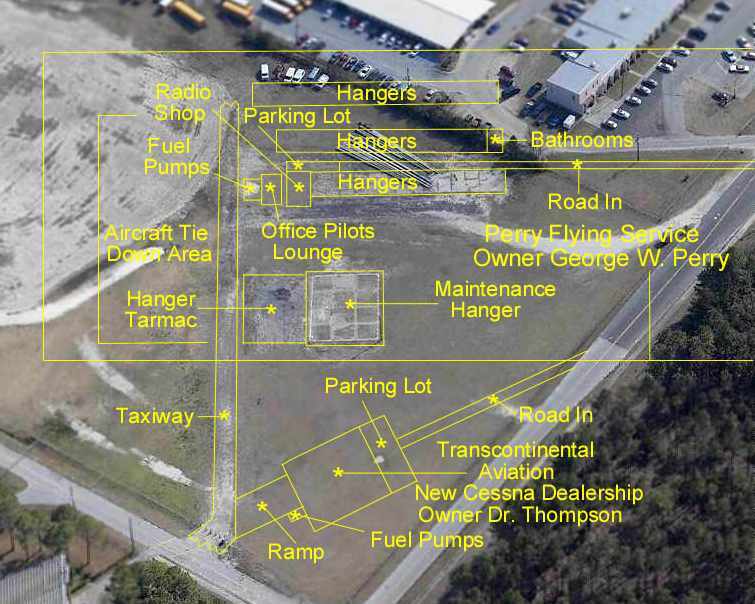 The circa 2006 aerial has been annotated by Mike Brzowski to show where the former Brunswick Airpark structures were located. along with some of the hangar foundations on the south side. The site of the original Brunswick Airport is located north of the intersection of 4th Street & Old Airpark Road, appropriately enough. 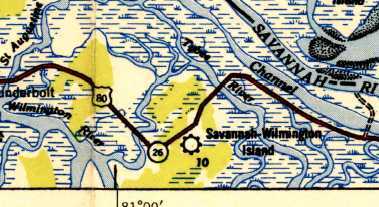 Savannah - Wilmington Island Airport, as depicted on the April 1945 Savannah Sectional Chart (courtesy of Chris Kennedy). The date of construction of this airport has not been determined. 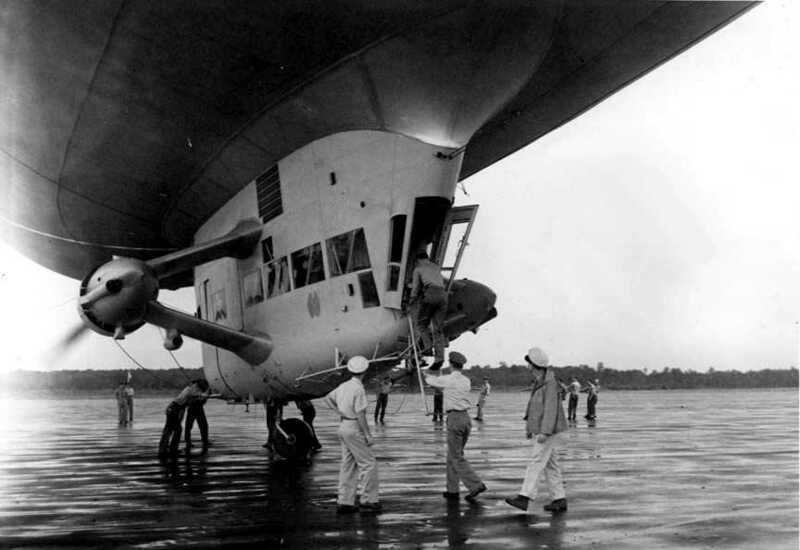 under the command of Captain S. E. Perkins and was based at the old Wilmington Island Airport. 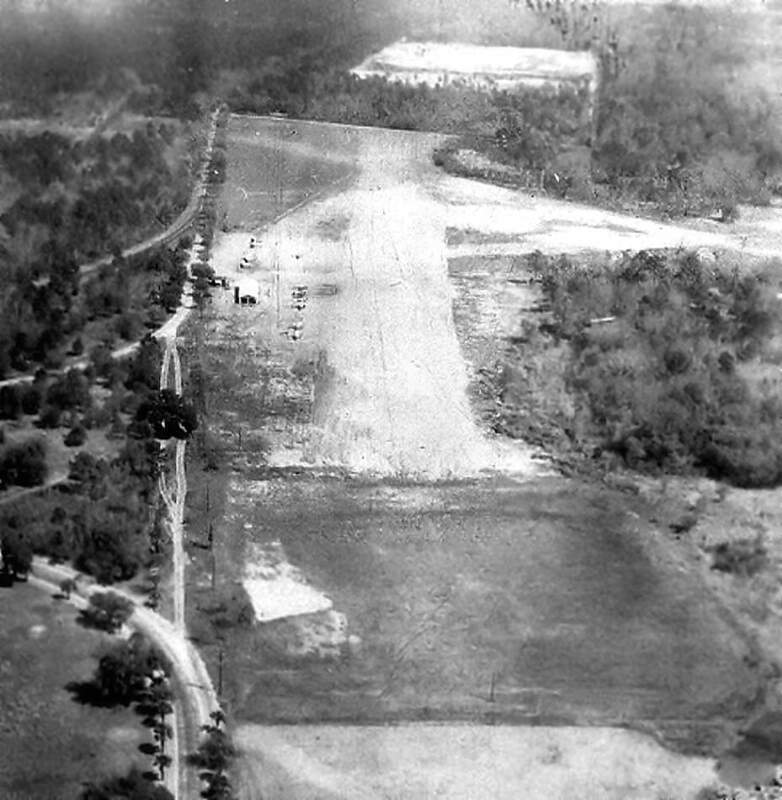 During the war years, this airfield was known as CAP Field, Savannah. and the actual labor was performed by members of the old CAP squadron." Robert Wilson recalled, “I learned to fly at this airport. It never had 5 runways. When I started there it had only 2. One of which was very short with an approach over some power lines at one end. We, CAP members, did clear & build a 3rd runway that was too short to safely use. I began to take flying lessons sometime in late 1943 or early 1944.
nor listed in the April 1944 US Army/Navy Directory of Airfields (courtesy of Ken Mercer). and went out to the Wilmington Island Airport for flying lessons. My Instructor was Bill Hobbs of Hobbs-Waller Avbia Service. I wish I had a photo of Hobb’s Field as it was affectionately known in the early days. and my solo took place on November 9, 1944. I subsequently flew a garden variety of light aircraft out of this field. 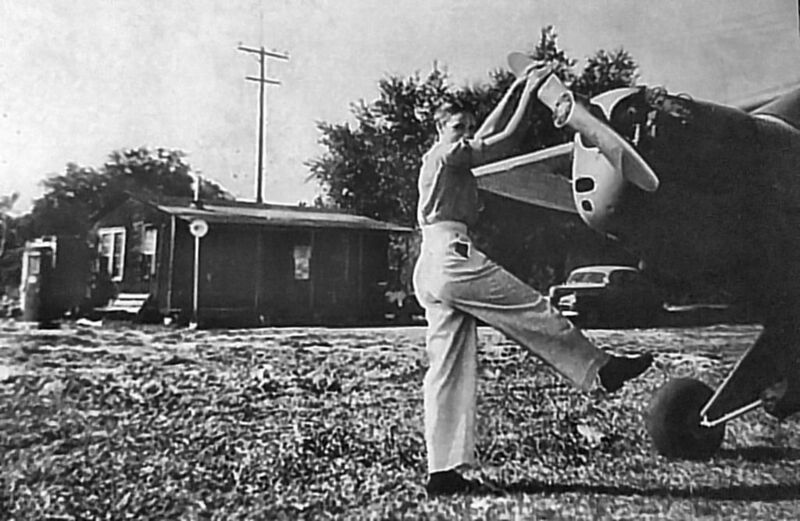 I took lessons in the Stearman PT-17 & had some wonderful acrobatic hops in that venerable/tough aircraft. I eventually owned it outright & flew it with enthusiasm. The stacks were blowing off & CAA advised me to recover the wings, replace stacks, and required other fixes. which depicted "Savannah Wilmington Island" as a commercial or municipal airport. with old Tybee Road at the left. The field had a small building on the north side, with several light aircraft parked. with old Tybee Road at the bottom. The field consisted of 3 unpaved runways. and operated by Hobbs & Waller Aviation Service. with the longest being the 3,000' north/south & east/west runways. and offering tie-downs, repairs, training, charter, and fuel. 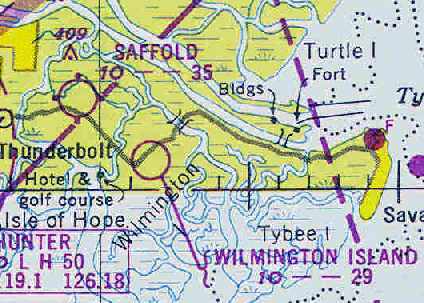 Wilmington Island Airport was not depicted on the 1945 USGS topo map. “Per Mom’s logbook, she soloed 10/23/46 in a Piper J-3 N38756, with 9 hours on the book, by W. Hobbs. She did a final check flight on 12/7/46 on Piper J-3 N38756, also signed off by W. Hobbs. propping a Piper J-3 Cub in which she was getting her Private Pilot checkride (courtesy of her daughter Amy Chancey). 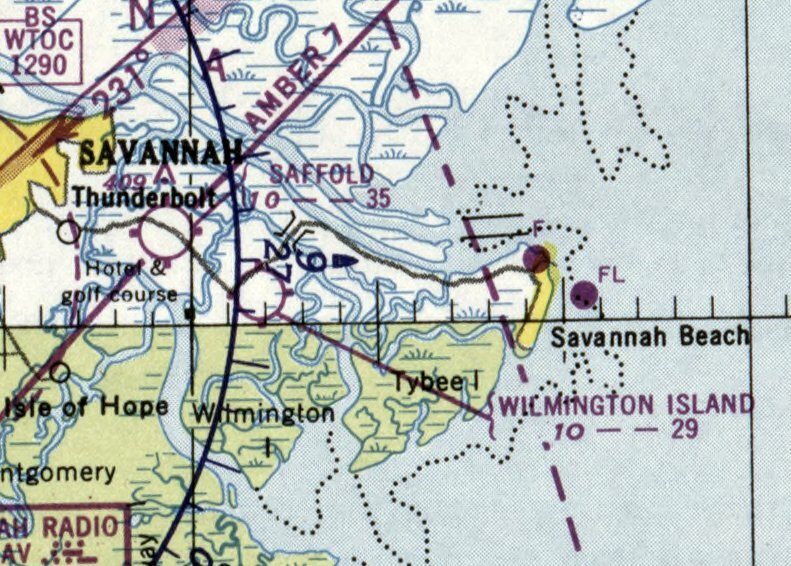 Savannah-Wilmington Island Airport was depicted on the 1948 USGS topo map as a commercial/municipal airport. The last aeronautical chart depiction which has been located of Wilmington Island Airport was on the February 1950 Jacksonville Sectional Chart. 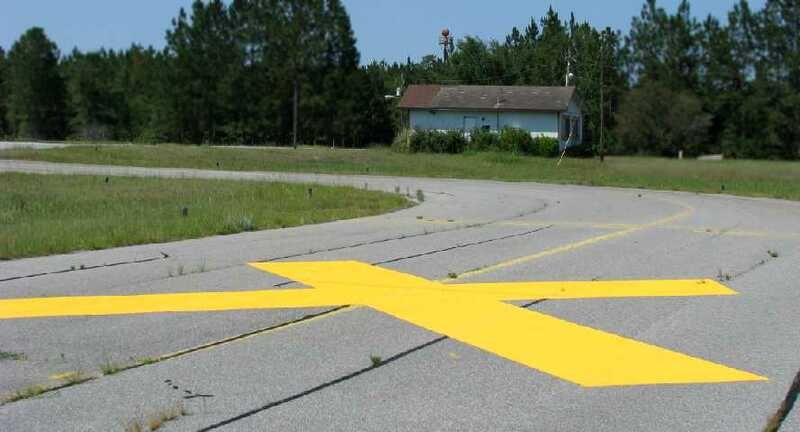 It depicted Wilmington Island Airport as having a 2,900' unpaved runway. 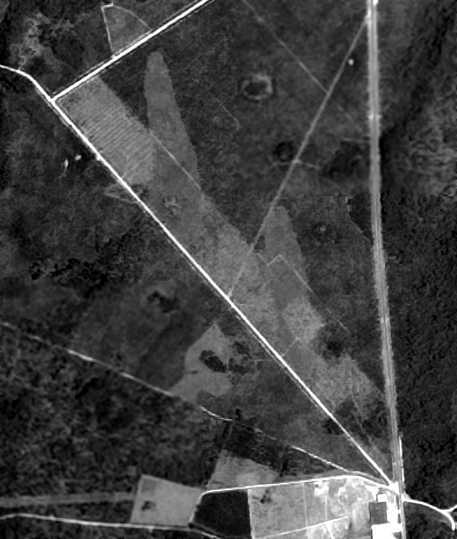 A 1951 USGS aerial photo (courtesy of David Henderson) may have showed the field after its closure. with the other 2 runways still being recognizable but deteriorated. One small building was located on the northwest side, but no aircraft were visible on the field. or the 1955 USGS topo map. to the City of Savannah for use as a municipal airport. Shortly after that, Hobbs moved his operations to the new airport. was filmed at night at the site of the old Hobbs airfield. Everybody on the island showed up to watch, including me. 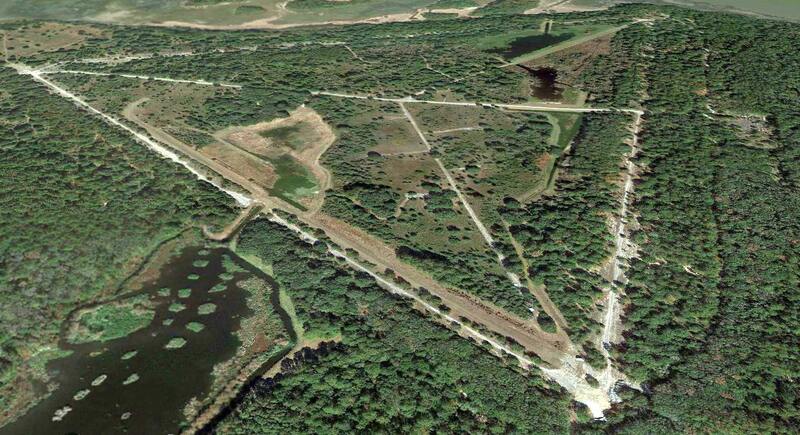 At the time there was not much left of the old airfield, pine trees and undergrowth having taken it over. mentioned as having donated or owning the land on which this field was established. I still have his C.A.P. hat, uniform and pins. I also have a few memories of the field, mostly second hand through my father. One though is first hand although I was very young at the time. My father woke me at nearly midnight one night. I was around 6 years old. I was told to put on my robe & slippers because there was something he wanted to take me to see. We drove across the island & stopped on the shoulder of the road which runs roughly parallel to the East west runway. He handed me a flashlight & instructed me to walk straight into the bushes & tellhim what I saw. What I saw made me burst into excitement & immediately ask if we were going to take it home. It was the entire fuselage of a Piper Cub or similar aircraft. The wing & stabilizer were removed & laid alongside the main fuselage, but at 6 years I was sure we could get it running in no time. Well, we didn't take it home but it was still an interesting experience. My father told me to watch what was happening here when I passed over the next few days. I noticed the plane had been reassembled & a crew of men were working in the general area. Next I saw the plane, appearing brand new, but leaning at about 45 degrees with tail in the air & nose in the dirt. That night he took me back down to see the crew with lightning machine in full flame & told me this would be on television very soon. So, I [can] reconfirm the account of the 'Route 66' episode. The lightning was much more convincing on TVas was the crash. the area had been densely redeveloped with housing. 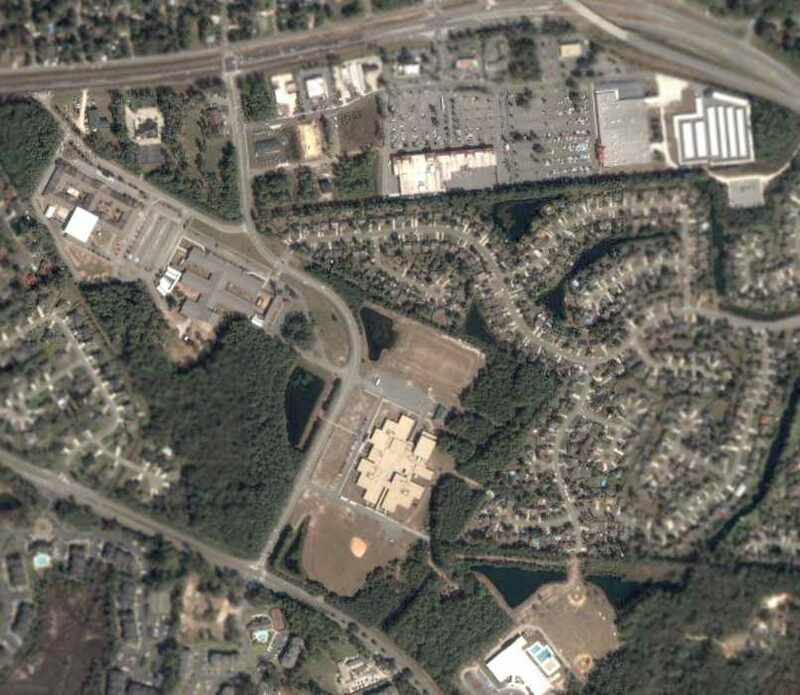 a private school & several subdivisions covering what used to be the old airfield runways. All traces are completely gone. Most people who live on the island now have no idea that there was ever an airfield here. The site of the Wilmington Island Airport is located south of the intersection of Johnny Mercer Boulevard & Penn Waller Road. Saffold Field, as depicted on the February 1949 Savannah Sectional Chart (courtesy of Chris Kennedy). as it was not yet depicted on the April 1945 Savannah Sectional Chart (courtesy of Chris Kennedy). 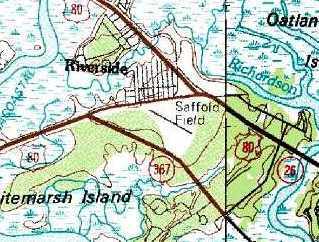 The earliest depiction which has been located of Saffold Field was on the February 1949 Savannah Sectional Chart (courtesy of Chris Kennedy). 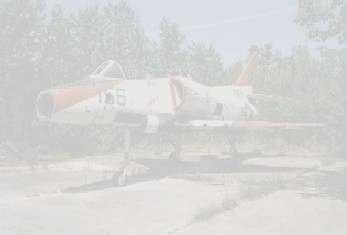 It depicted Saffold as having a 3,500' unpaved runway. 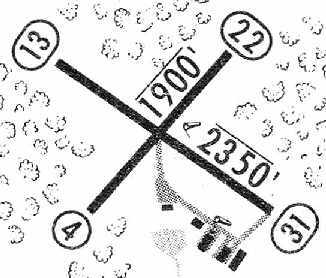 The February 1950 Jacksonville Sectional Chart depicted Saffold Field as having a 3,500' unpaved runway. 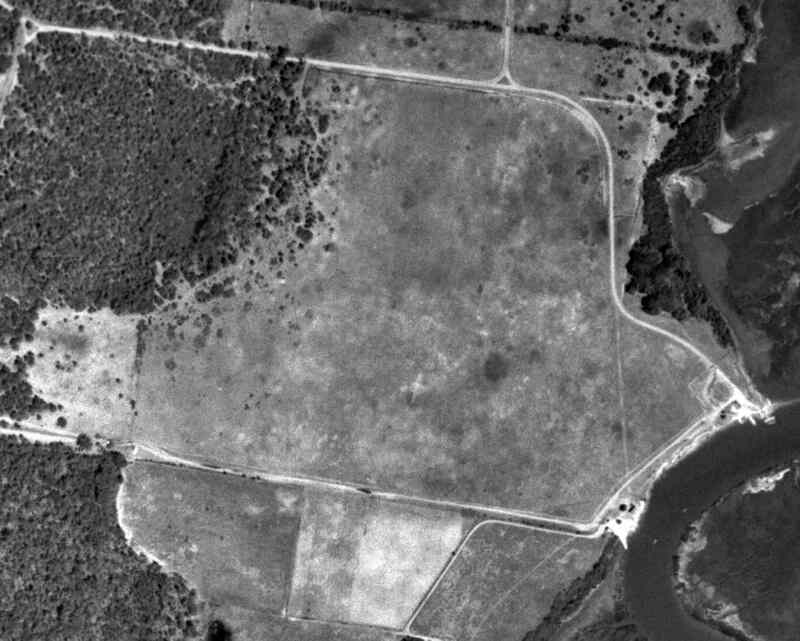 The only aerial view which has been located of Saffold Field was a 3/22/51 USGS aerial photo (courtesy of David Henderson). with one single-engine aircraft & several small buildings on the southeast side. The 1955 USGS topo map depicted Saffold Field as having two 3,500' unpaved runways, with several small buildings on the south side. Don Imbody recalled, “I flew out of Saffold Field in 1959 as a student pilot while I was stationed at Hunter AFB. Saffold Field had trees on 3 ends of the runways & power lines on the 4th end of the runway. as having 2 sod runways: a 3,800' Runway 3/21 & a 2,500' Runway 12/30. and the operator was listed as Flight Service Inc.
described Saffold as having 2 runways, with the longest being a 3,500' turf strip. 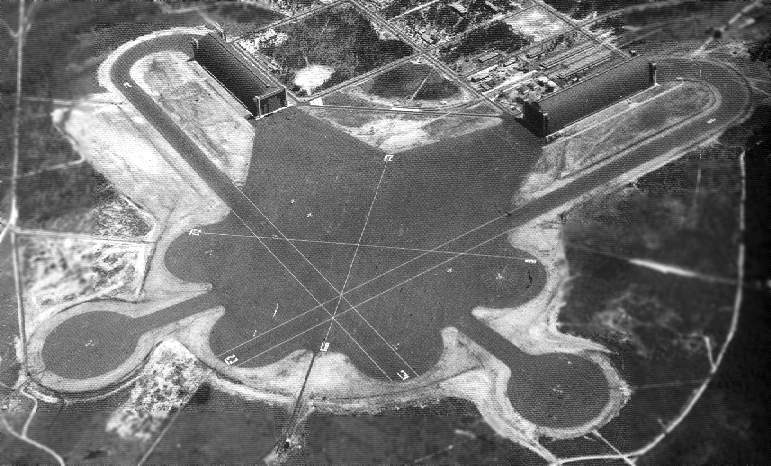 Saffold Field was used as a helicopter training field by the Army. All the signage was replaced by signs in Vietnamese, which was a little disconcerting to local residents. It appeared that the Army wanted to create a realistic landing zone atmosphere at the field. Al Fitzgerald recalled, “Saffold Field was used by the Army in the mid-late 1960s as a site to practice Ground Controlled Approaches (GCA). I was teaching instruments in those days & there was a portable GCA radar set up at Saffold. 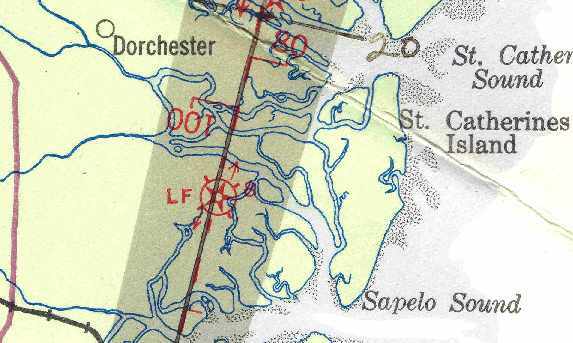 The last aeronautical chart depiction which has been located of Saffold Field was on the 1966 Savannah Sectional Chart. 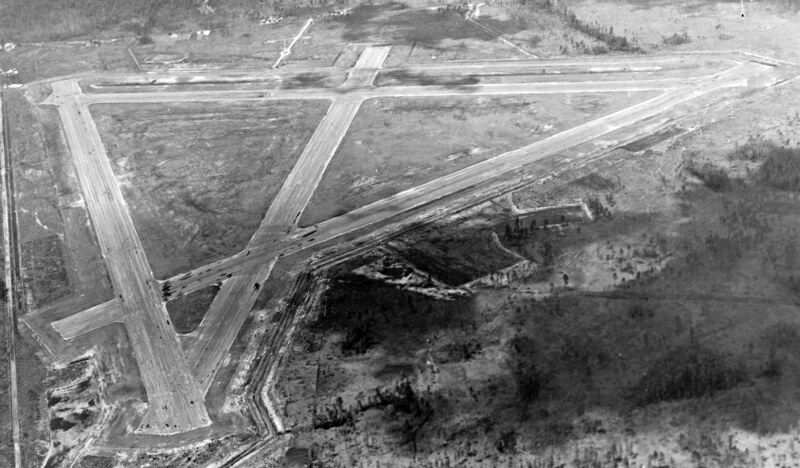 The airfield's status had apparently changed at some point between 1964-66 to a private airfield. 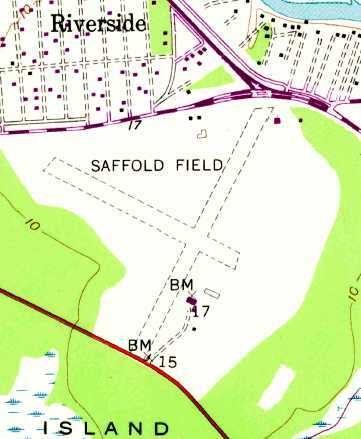 The 1978 USGS topo map showed Saffold Field as having two 3,500' unpaved runways. 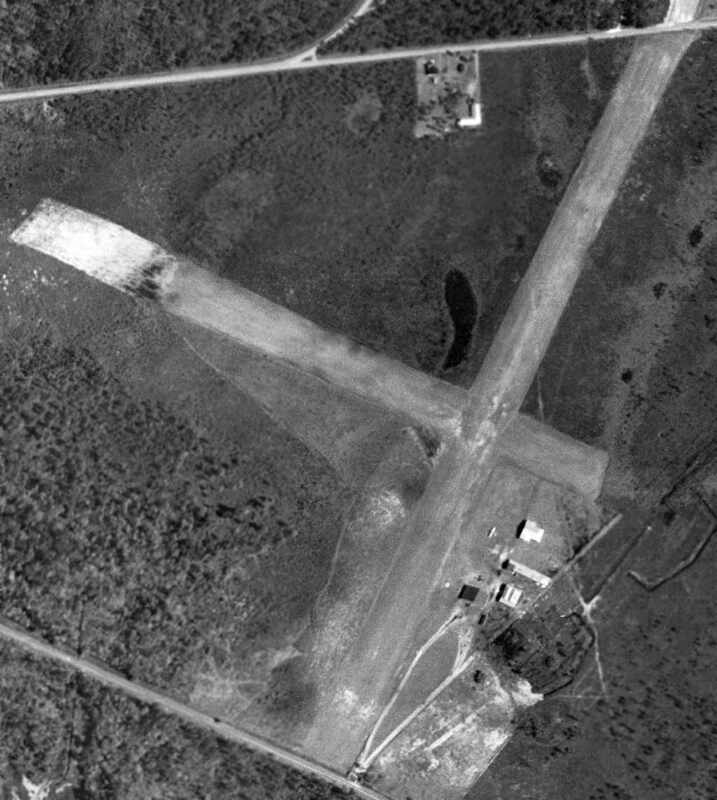 Only a single building was depicted on the field - a small building, just south of the runway intersection. Saffold Field was no longer depicted at all on the 1978-79 GA Aeronautical Chart (courtesy of David Stevenson). but with only one runway (the northwest/southeast strip). although the field's status was described as "Private. Closed to Public." 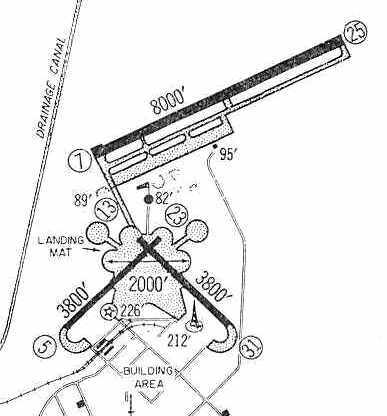 The airfield configuration had been reduced to a single 2,640' turf Runway 12/30. Saffold Field was apparently closed at some point between 1982-95.
in order to build what was supposed to have been elementary, middle, and high school campuses. had been reused for 2 elementary schools & a middle school. However, the rectangular outline of the northwest & southwest halves of 2 of the former runways were still quite apparent. it was mowed but I think I only ever saw one aircraft there. There was something about it having to be maintained as an airfield to remain in the family. when comparing this photo with the airfield layout as depicted in the 1978 USGS topo map. The site of Saffold Field is located south of the intersection of Saffold Road & Whitemarsh Island Road. 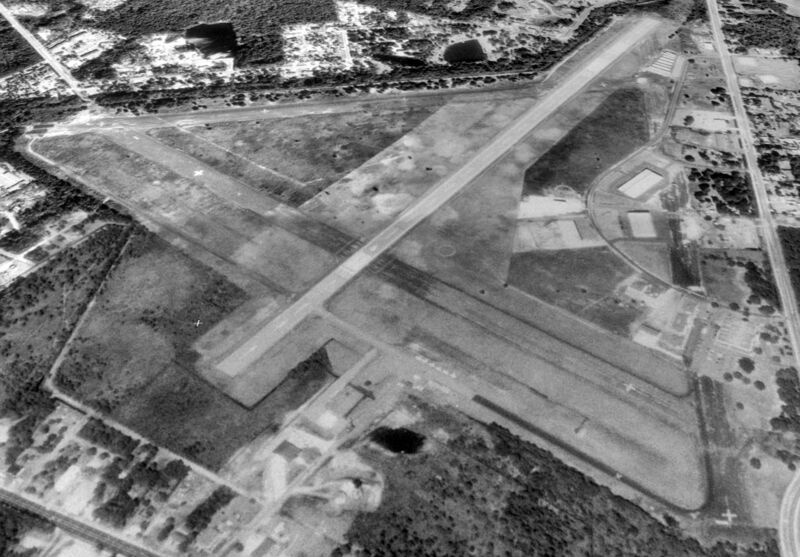 A 1974 USGS aerial photo (courtesy of David Henderson) of the Shellbine runway. Nothing was yet depicted at this location on a 1958 USGS topo map. 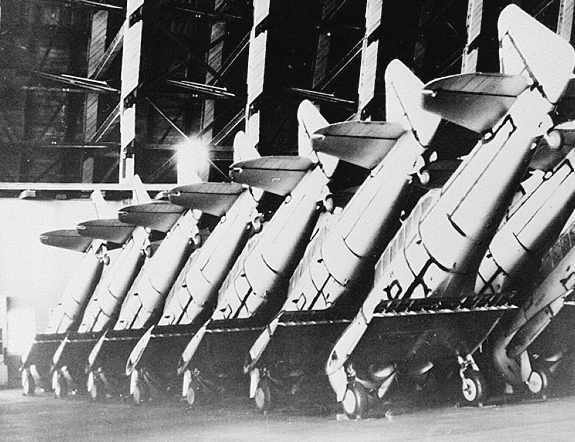 of the largest & most powerful rocket motors ever built in the United States. Thiokol received 3 parts of a 4-part contract by the NASA acting in conjunction with the Air Force. both to be assembled and tested at the new Thiokol plant in Camden now under construction. looking toward the use of solid propellants for space vehicles." According to Gene Greneker, the Georgia plant was previously described on Thiokol's web site. "There was a small photo at the previous web site of the casting pit being built. and more than 100 feet deep that was intended to serve as a combination casting pit & curing oven. The old timers tell me that one engine was tested in the casting pit with the blast going straight up. It seems that it was heard over a large radius around the area." on the north side of the complex, just to the south of the Schooner Landing rocket test site. 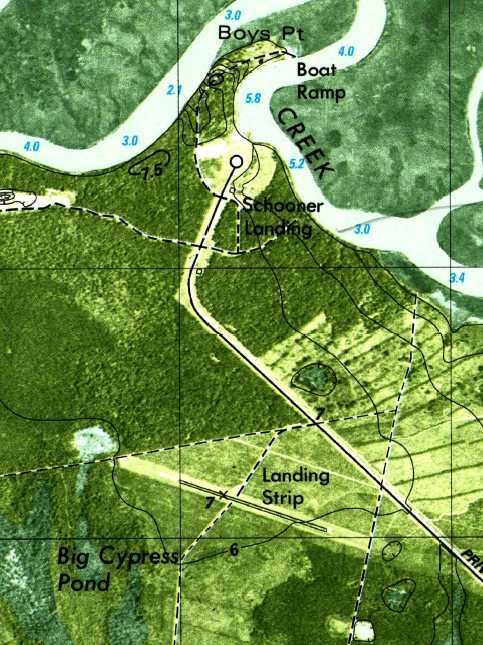 According to Clifton Cox, “The landing strip was built so NASA had a place to land at the site. during a hydrostatic pressure test at 50% rated strength. It seems that NASA & Thiokol did not have the instrumentation to detect the type flaws that caused the failure at that time. A small crew stayed at the Georgia Plant trying to find a use for the facility." normally an enemy soldier approaching a camp's perimeter). Bill Boles recalled, “I was Chief of Quality Control for Thiokol from 1969 until 3 months after the explosion on 2/2/71. On 2/2/71, an explosion at the Thiokol plant killed 34 people and injured 150. That ended the use of the facility to manufacture flares. most of the injured were flown by Perry Flying Service Aircraft into Brunswick with a few to Jacksonville. 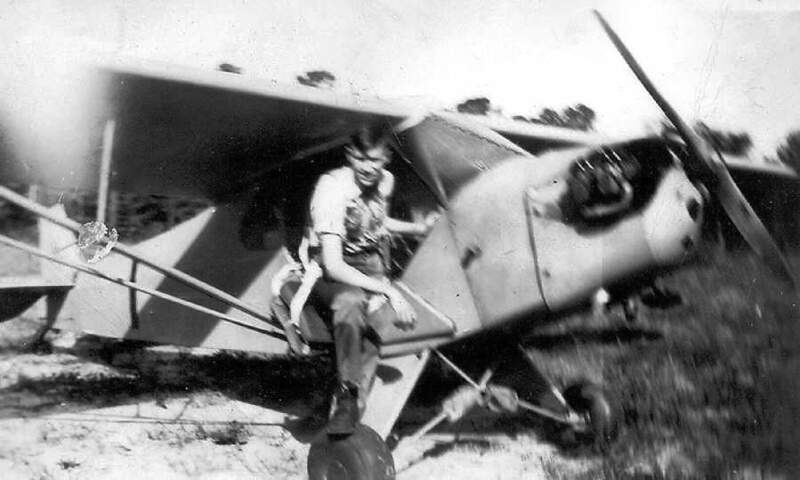 George Perry would not accept an payment for the many flights his aircraft made that day. to fly their upper management members to & from Jacksonville on their visits to the plant. Gene Greneker recalled, "In the 1970s the Georgia Facility was sold to Union Carbide. Now it is an insecticide plant. 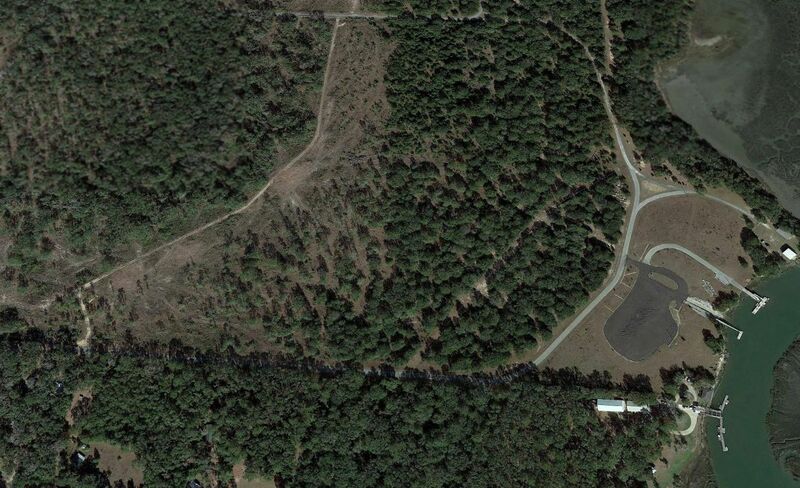 You can still see the rocket fuel storage bunkers from the sat photos around the oval access road." 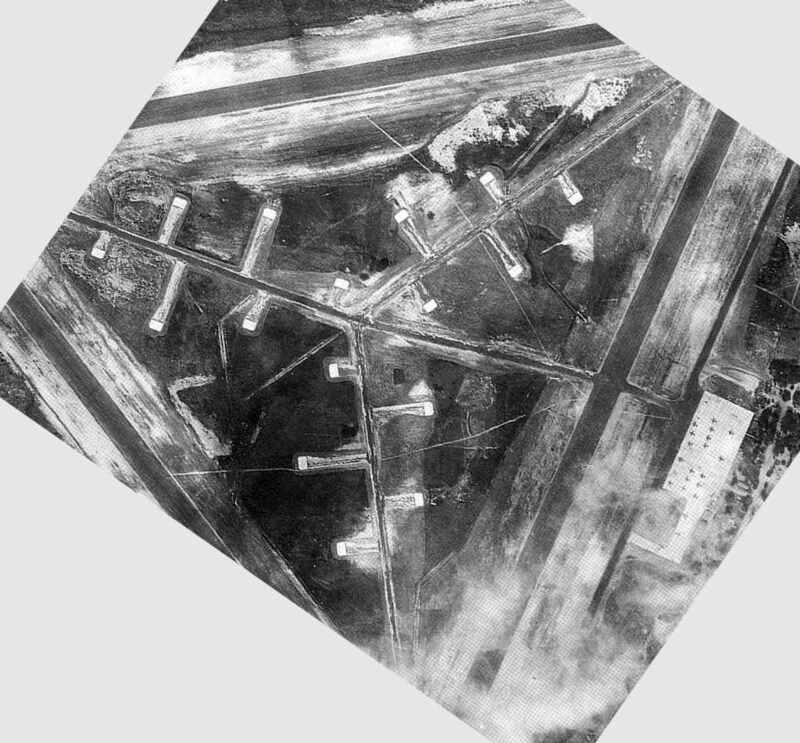 The earliest depiction which has been located of the Shellbine Airfield was a 1974 USGS aerial photo (courtesy of David Henderson). It depicted the field as consisting of a single asphalt Runway 11/29, with no buildings or other improvements. 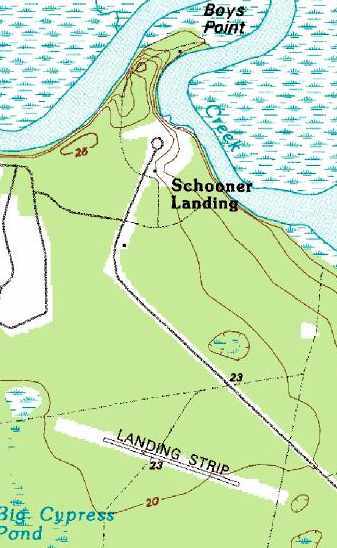 The 1979 USGS topo map depicted a single northwest/southeast runway, labeled simply as “Landing Strip”. 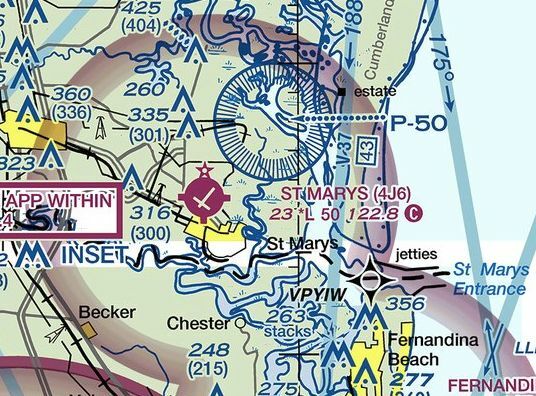 The 1995 USGS topo map depicted a single 2,300' runway, labeled simply as “Landing Strip". 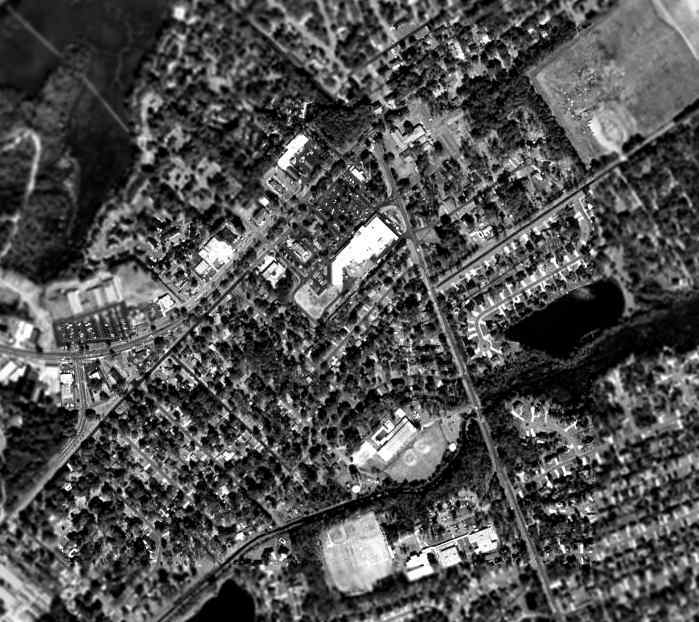 as depicted on the 2003 USGS aerial photo. but the site was depicted as "plant". A 5/28/17 aerial view by James Kleen looking north at the former Shellbine runway (on the left). A 5/28/17 aerial view by James Kleen looking east at the former Shellbine rocket test pad. three miles northwest of Shellbine, GA. 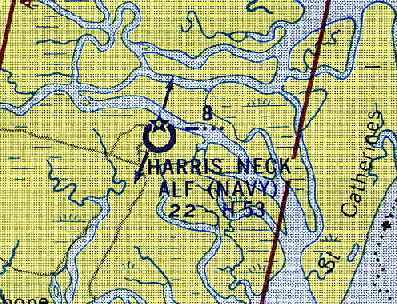 The Harris Neck Intermediate Field, as depicted on the 1935 U.S. Navy Aviation Chart (courtesy of Chris Kennedy). established for the emergency use of commercial aircraft flying on airways between major cities. as it was not yet depicted on the 1929 Rand-McNally Air Tails Map of GA (according to Chris Kennedy). 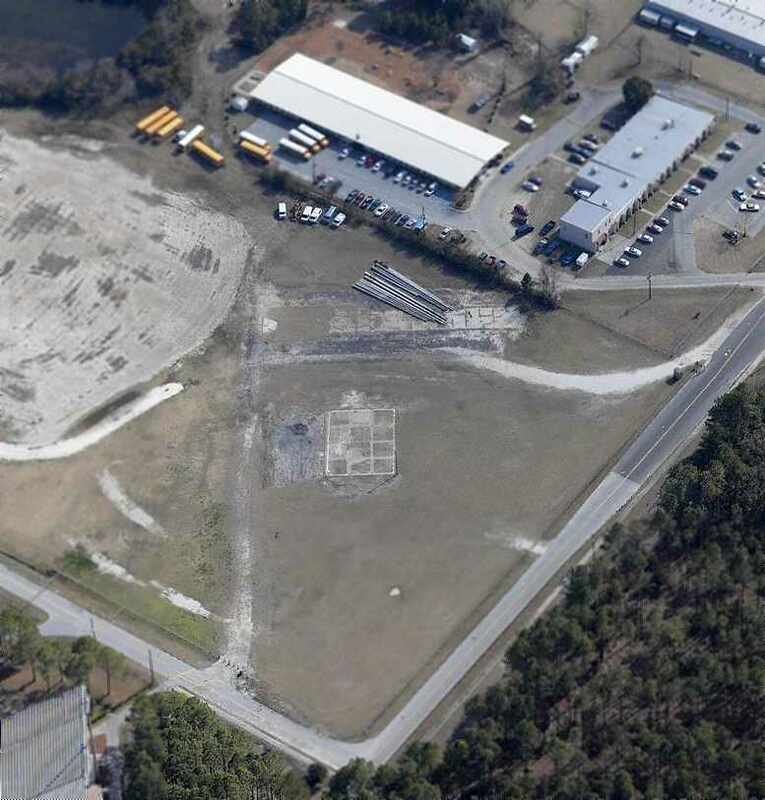 It described the Harris Neck Intermediate Field as the Department of Commerce's Site #8 along the Jacksonville – Richmond Airway. and to consist of an irregularly-shaped 93 acre sod parcel, measuring 2,600' x 2,550'. The field was said to be illuminated, but to offer no services. 2,600' east/west & 2,550' north/south. 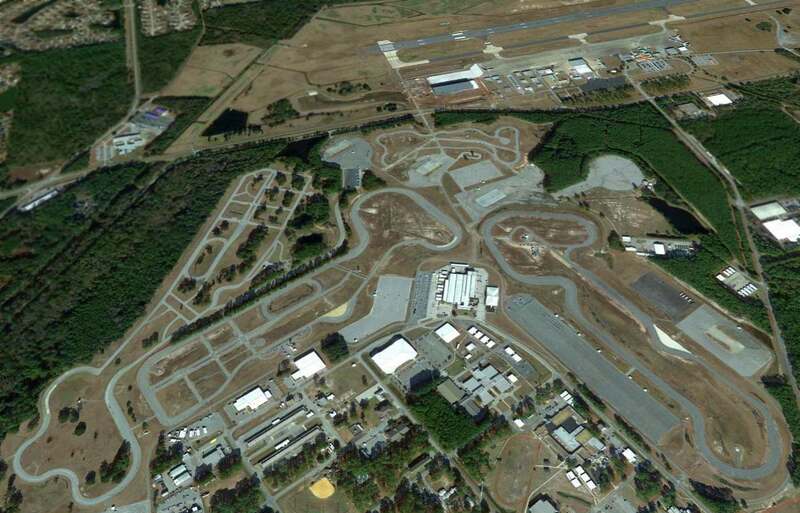 It described the field as being the Department of Commerce's Site #8 along the Jacksonville – Richmond Airway. Site #8 along the Jacksonville – Richmond Airway. to the newly-built Harris Neck Army Airfield (top of photo). 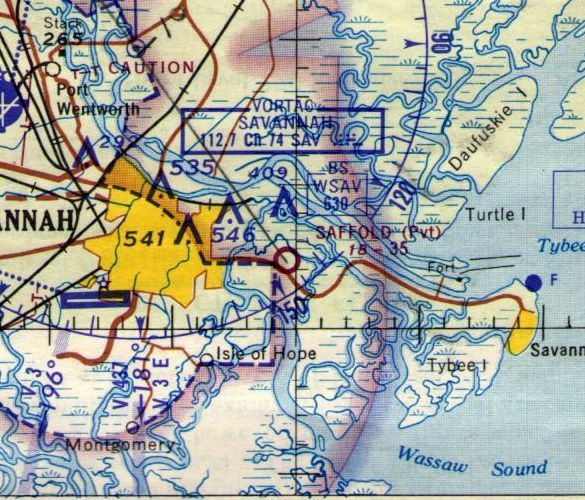 as only the much larger Harris Neck Army Airfield was depicted on the January 1944 Jacksonville Sectional Chart (according to Chris Kennedy). 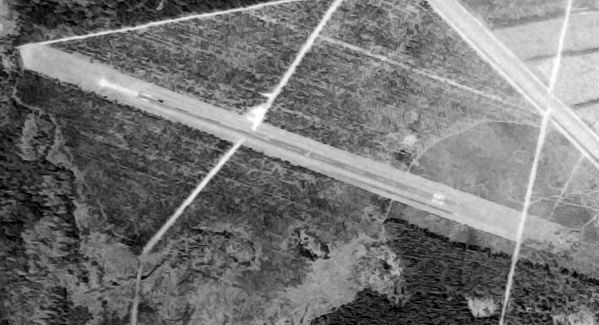 A 3/21/51 USGS aerial photo did not depict any recognizable trace of an airfield, just an open grass field. 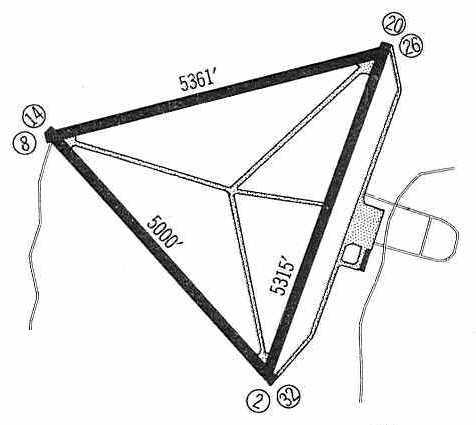 The 1959 USGS topo map still depicted a “rotating light” on the south edge of the airfield site, no doubt a remaining airway beacon. A 2016 aerial view looking north showed not a trace appears to remain of the former Harris Neck Intermediate Field. The site of Harris Neck Intermediate Field is located northwest of the intersection of Route 29 & Harris Neck Road. 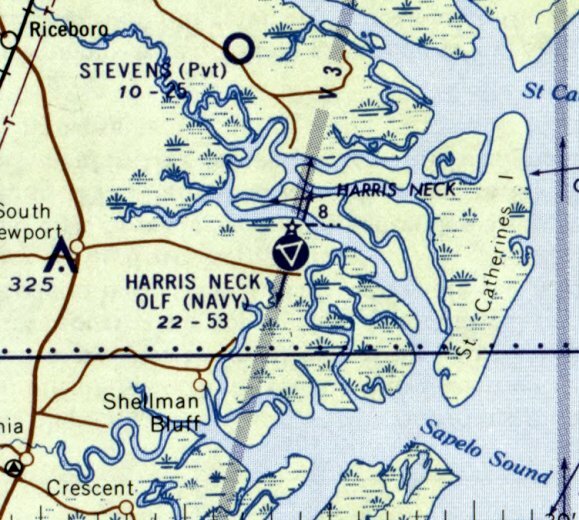 A 1942 Army map of Harris Neck AAF. 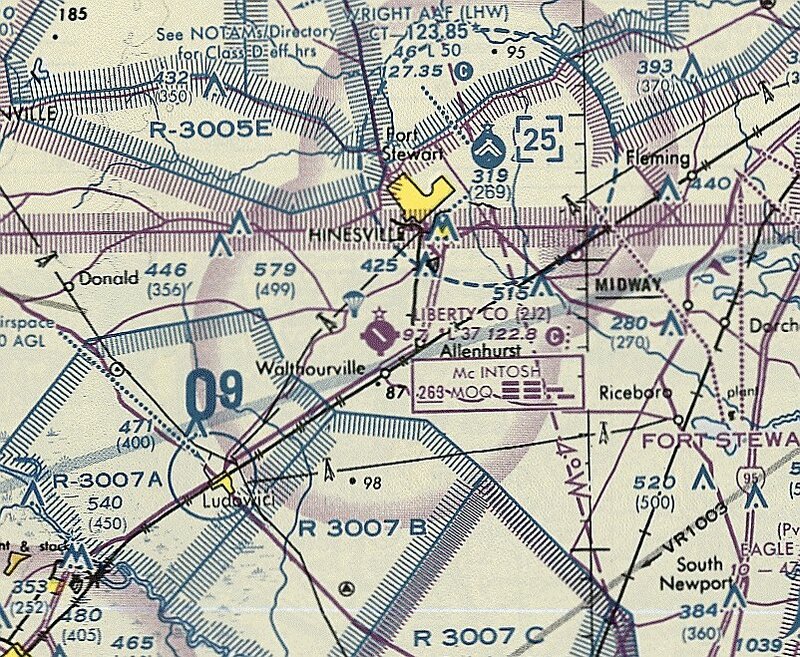 Harris Neck Army Airfield was not yet depicted on the September 1942 Jacksonville Sectional Chart. This airfield is located on an island along the Atlantic coast, barely a few feet above sea level. which was a combat command base primarily for fighter planes. P-39 & P-40 fighters operated from Harris Neck. 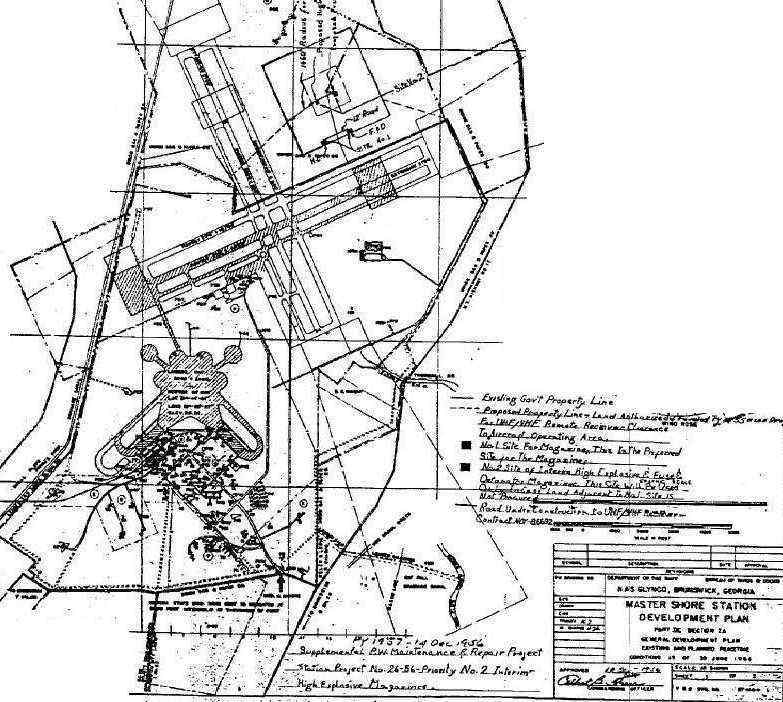 The earliest depiction which has been located of Harris Neck Army Airfield was on a 1942 Army map. 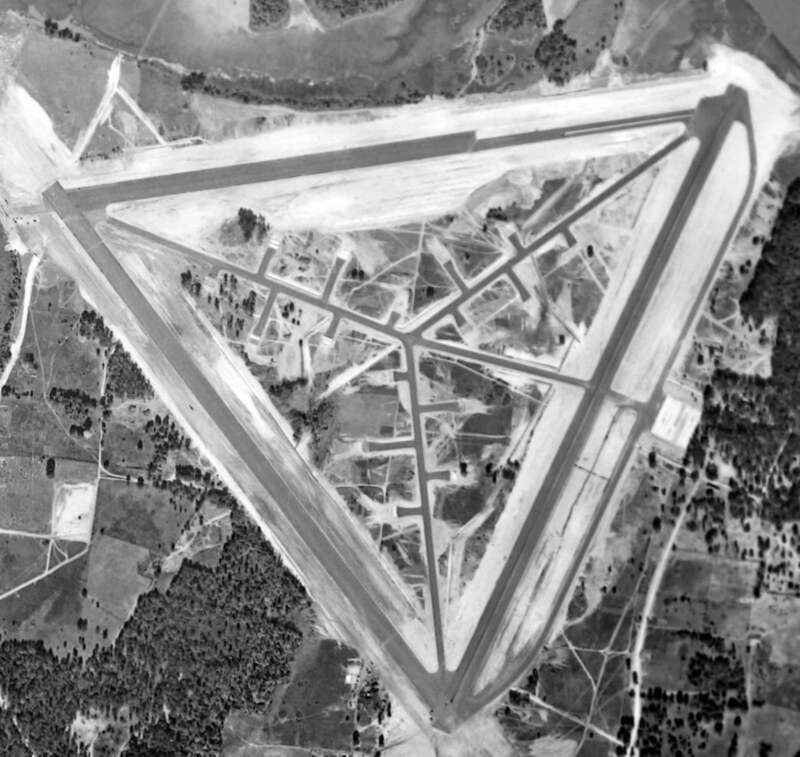 The airfield consisted of three 3,500' paved runways, taxiways, and a large quantity of dispersal pads. 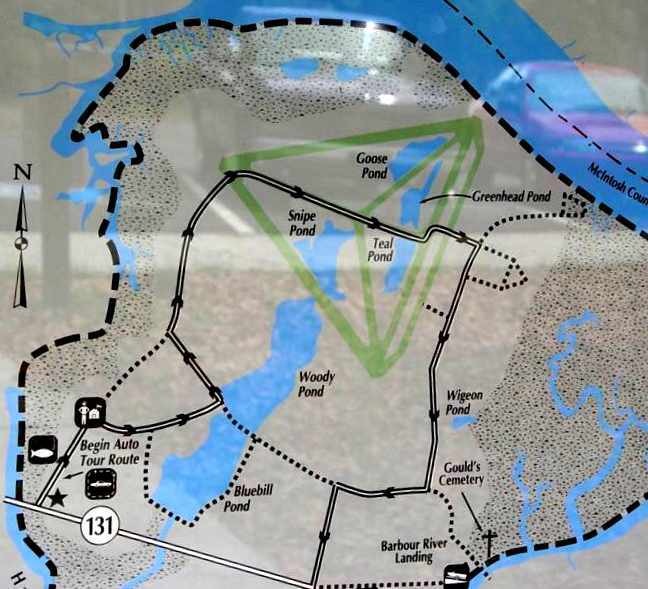 The military property was a total of 1,200 acres. 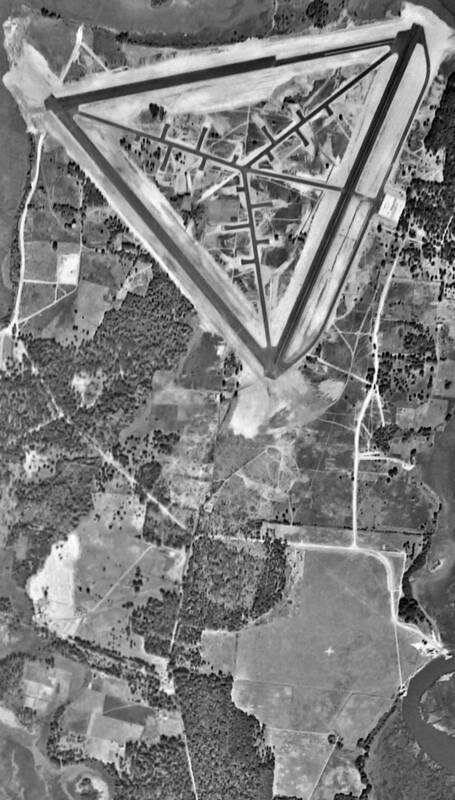 The earliest photo which has been located of Harris Neck Army Airfield was a circa early 1943 aerial view (National Archives, courtesy of Brian Rehwinkel). Brian Rehwinkel noted, “The photo shows the field before all of the runway paving has been completed. the first group of buildings were accepted by the Army on 1/28/43. was on the January 1944 Jacksonville Sectional Chart. showing about 20 planes on the parking ramp, and 16 dispersal hardstands. 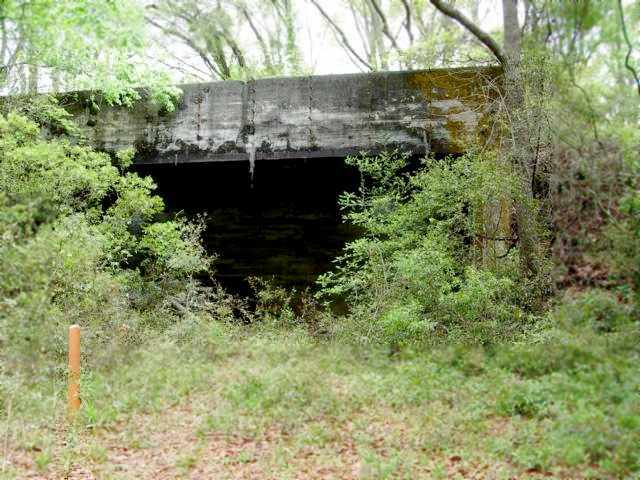 while a 1945 AAF Installations Directory listed it as a sub base of Statesboro AAF, GA.
Harris Neck AAF was deactivated in 1944. 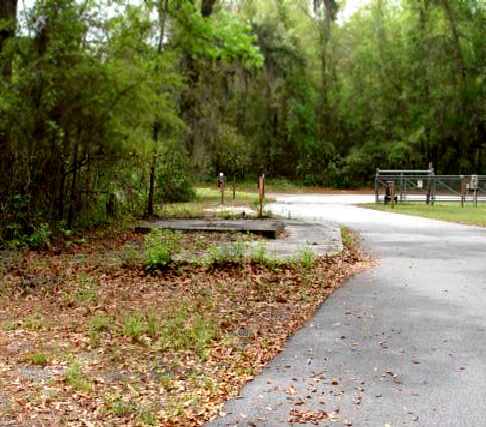 After WW2, the property was given to McIntosh County for use as a municipal airport. and described as having a 5,400' hard-surface runway. 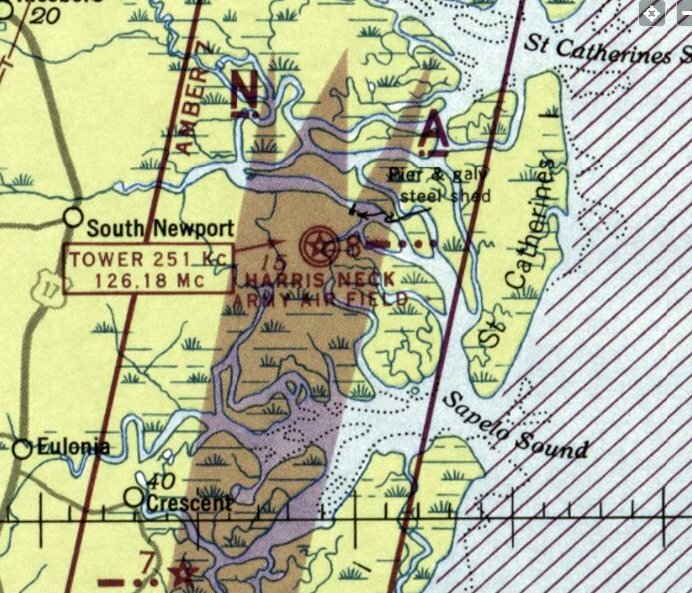 Harris Neck was transferred at some point to the Federal Aviation Administration. and the field remained in fine condition, but there were no aircraft visible on the field. 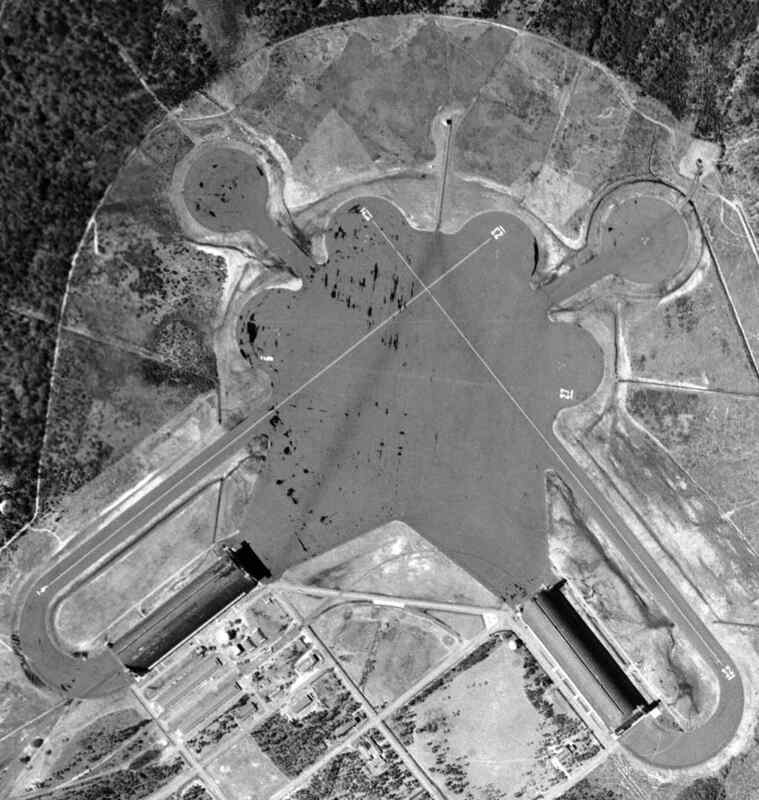 with paved taxiways leading to a network of 16 parking revetments in the center of the field, and a ramp with one building on the east side. and the remarks in the Aerodromes table said "ALF to NAS Glynco. Closed to all traffic except on prior approval. CAA Site 8 on field." Richard Legg recalled, “While an aircrewman with ZP-2 [NAS Glynco 1957-59] we often flew to Harris Neck ALF to conduct touch and go landings. The field was used to graze cattle & we had to buzz the field first to scatter the beasts. that in case of a nuclear attack in which we could not return to NAS Glynco we were directed to proceed to Harris Neck. had removed & sold all wooden structures from Harris Neck & sold them for profit. but the field was said to be "Closed to all traffic except on prior approval." 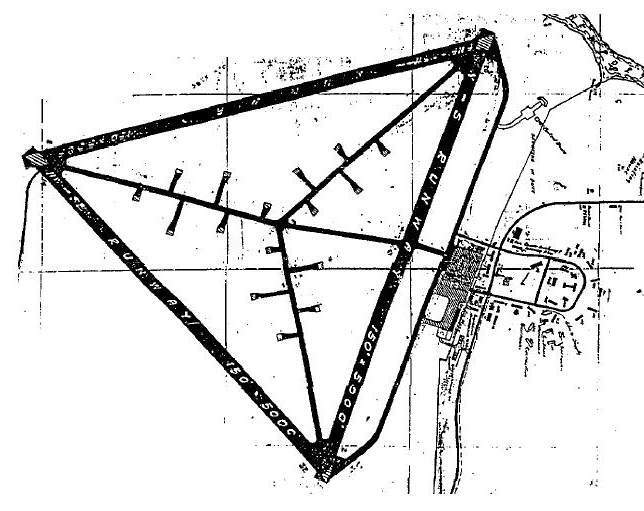 The field was depicted as having 3 paved runways, with the longest being the 5,361' Runway 8/26. but it did not appear to have been big enough to be a hangar. was on the August 1960 Jacksonville Sectional Chart. 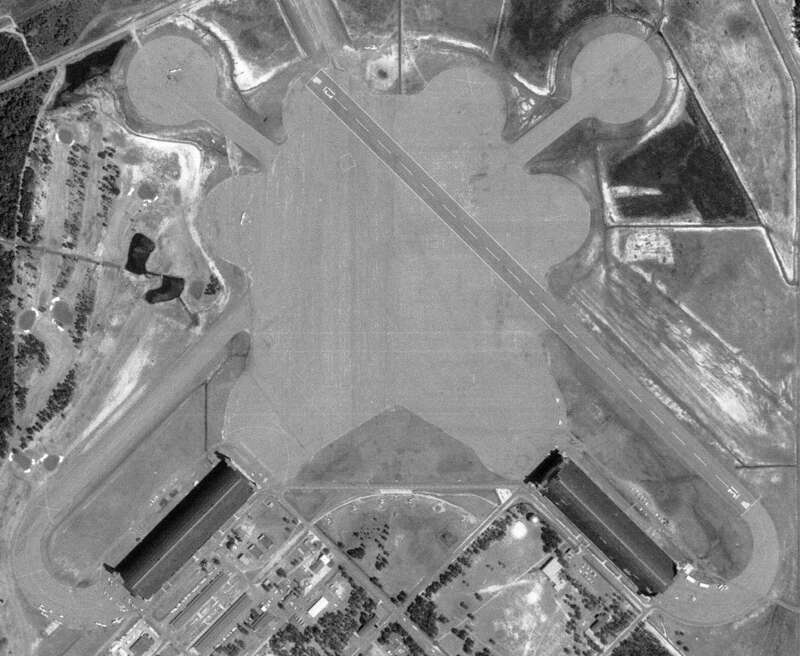 It depicted "Harris Neck OLF (Navy)" as having 3 paved runways, with the longest being 5,300'. acquired the Harris Neck property & established the area as a migratory bird refuge. That is presumably when the airfield was closed. 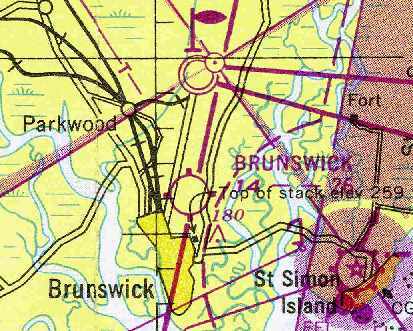 Harris Neck was depicted as an abandoned airfield on the March 1964 Jacksonville Sectional Chart (courtesy of Ron Plante). along with its network of taxiways & dispersal pads. As of 2002, the property is still operated as the Harris Neck National Wildlife Refuge. 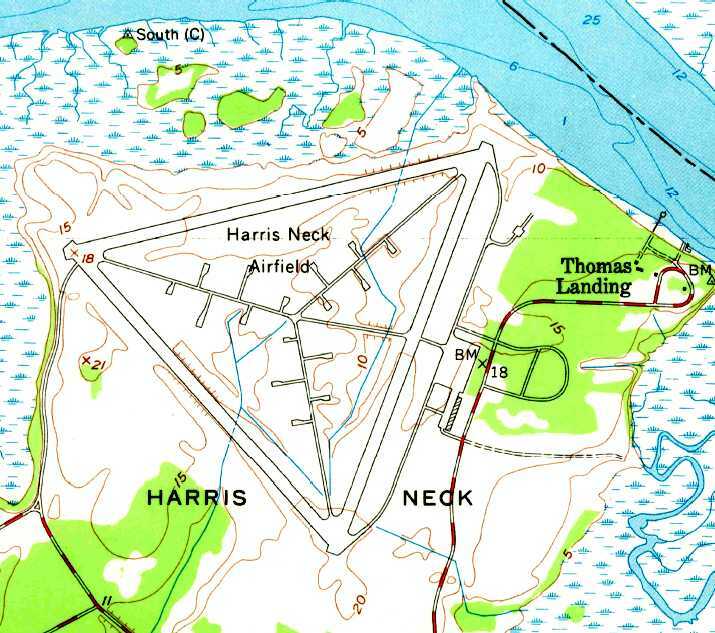 Harris Neck was still depicted as an abandoned airfield on 2002 aeronautical charts. 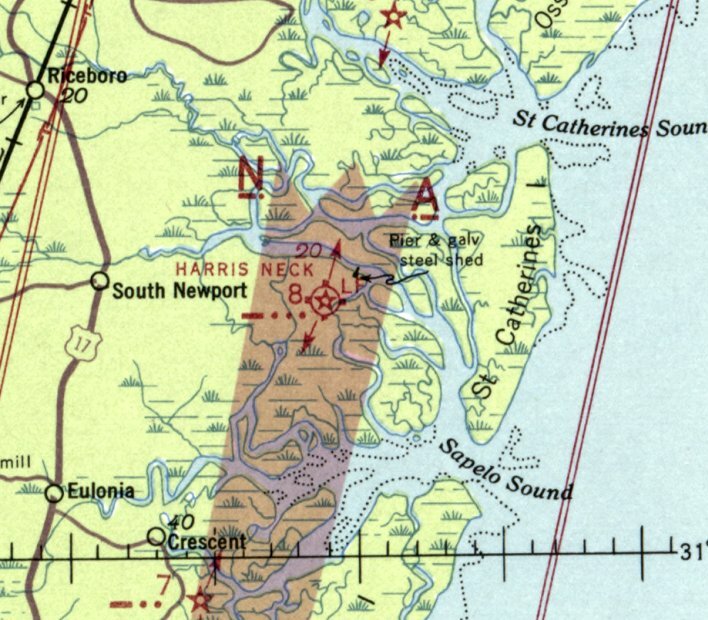 A 2004 photo by Les Parker of the map of the Haris Neck National Wildlife Refuge. only to discover that it had once been an airfield. Other than the runways & taxiways there is very little left to show what this area once was. The area is very overgrown & travel is limited by 'keep out' signs. It's my feeling that the wildlife folks want the area returned to nature as rapidly as possible. so it is possible to drive where the wildlife service wants you to drive. I would strongly recommend very good snake boots if any off road exploring is planned. We saw the largest copperhead we've ever seen sunning on a section of the old runway. The surrounding woods are full of roads but they don't show up on your map." 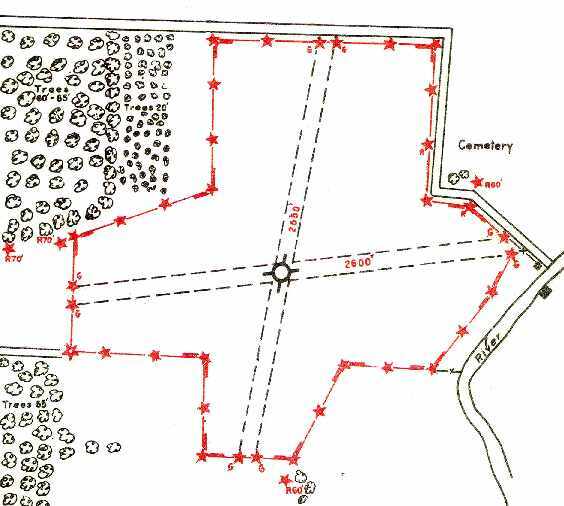 Les Parker reported in 2004, "Your map shows a short road near the upper right hand corner leading to some kind of bunker. It is still standing and is the only building we saw anywhere." A 2004 photo by Les Parker of the foundation of the former guard shack for Harris Neck AAF. A 2004 photo by Les Parker of the remains of the Harris Neck trash incinerator. 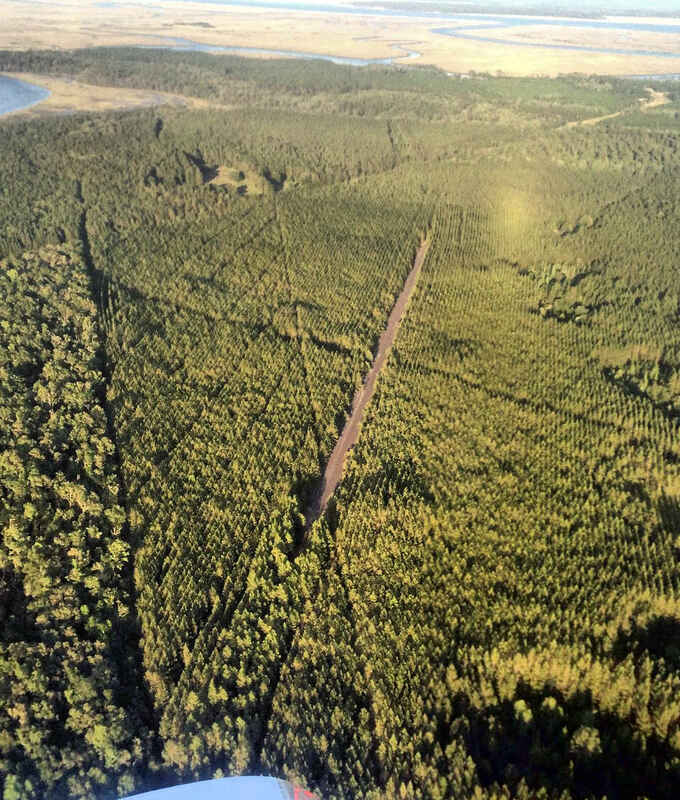 A 2009 photo by Joe Burke looking along a former Harris Neck runway. A 2009 photo by Joe Burke of a historical plaque at the site of Harris Neck AAF. An 11/8/14 aerial view by Dean Baker looking northeast at the remains of the Harris Neck AAF runways. Brian Rehwinkel reported in 2016, “The former [Harris Neck] AAF is a great place to visit. There is a loop road for driving around the refuge. It goes through the middle of the airfield & is about 3-4 miles in length. A 2016 aerial view looking north showed that Harris Neck's former runways, taxiways & dispersal pads still remained remarkably intact. 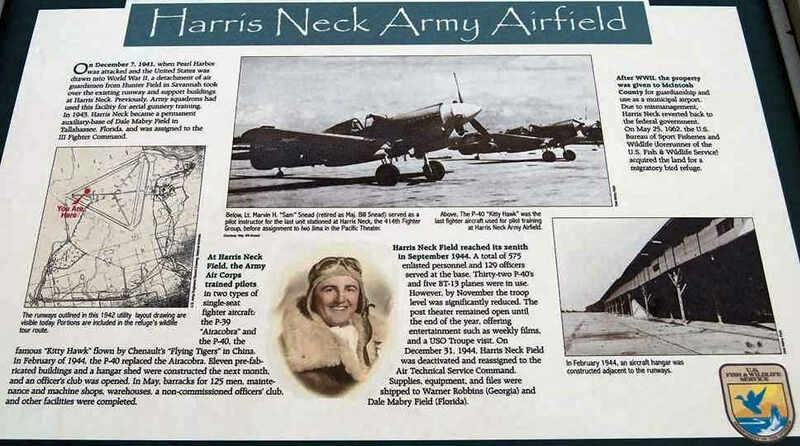 The Harris Neck Army Airfield is located north of the intersection of Route 131 & Harris Neck Airport Road, appropriately enough. with one blimp on the large circular blimp field. 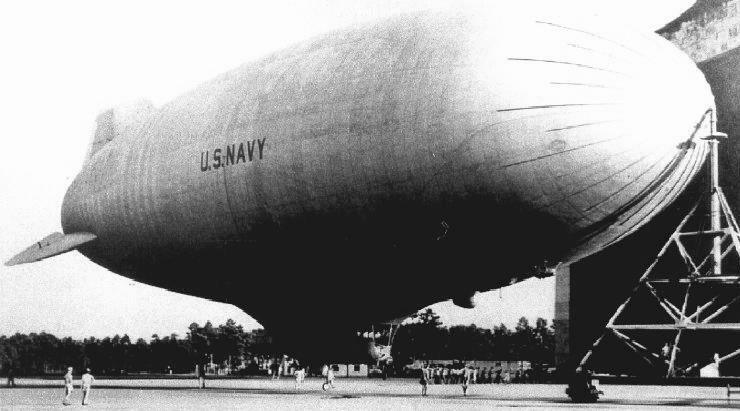 Naval Air Station Glynco was built in 1942 as Navy antisubmarine blimp base. fabricated & numbered, and shipped to Glynco on rail cars. NAS Glynco was not yet depicted on the September 1942 Jacksonville Sectional Chart. 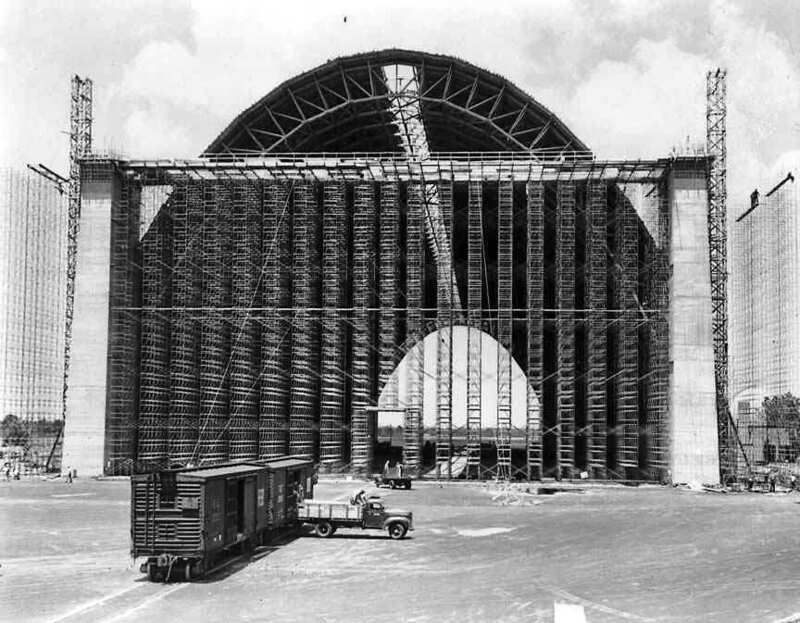 A circa 1942 photo showing Glynco's massive Hangar 1 nearing completion. 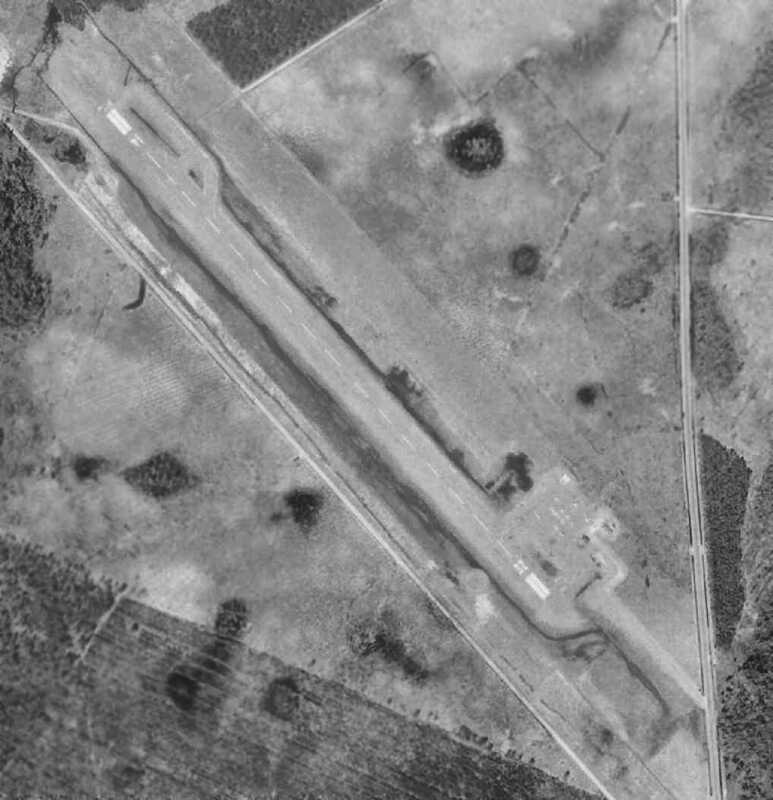 A 1942 aerial view of NAS Glynco (from the Vanishing Georgia Collection of the Georgia Archives). an operational complement of 12 blimps, and a helium plant. The number of buildings constructed during the WW2 period was approximately 500. (their remains are visible southwest of the current runway as a cluster of circular clearings). 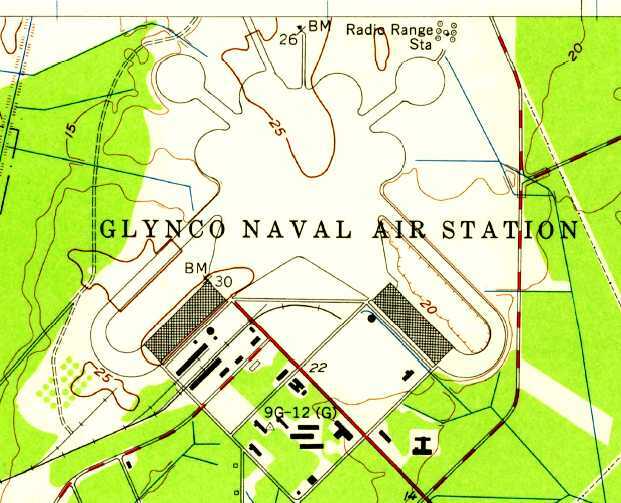 It depicted “Glynco (Navy)” as a military airfield with a control tower. also depicted “Glynco (Navy)” as having a blimp mooring mast. A WW2-era view of Glynco, looking south. National Archives photo. and it became a storage & salvage yard for some 800 Navy aircraft. (from the Vanishing Georgia Collection of the Georgia Archives). 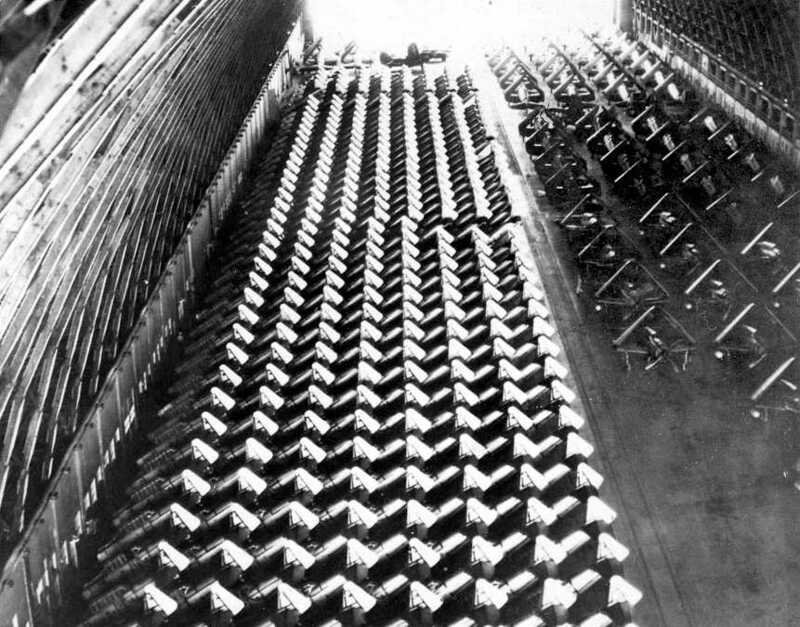 A post-WW2 view of hundreds of SNJ trainers & other Navy aircraft stored inside one of the Glynco's blimp hangars. along with the mooring mast symbol. A 1951 aerial view (courtesy of David Henderson) depicted NAS Glynco's massive blimp hangars, and 2 fixed-wing aircraft runways were marked out as well on the large paved landing mat. In 1952, Glynco underwent a significant expansion, and an 8,000' runway was built for jet aircraft operations to the north of the WW2 blimp facility. The base eventually totaled over 4,434 acres. At one time, the base could boast of being the only air station operating every type of aircraft: blimps, propeller aircraft, jets & helicopters. These included the P2V Neptune, E-2B Hawkeye, T-33, T-39 & A-4. The newer aircraft were required to support advanced pilot training & the Naval Air Technical Training Command (NATTC). NATTC provided advanced & specialized training for the Combat Information Center, air traffic control & associated equipment maintenance. 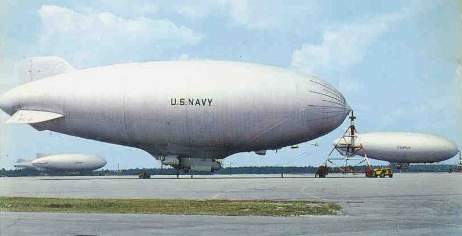 ZS2G-1 (5-K) airship moored to a mobile mooring mast in front of a Glynco hangar. According to Richard Legg, the first ZS2G-1 “was not delivered to the US Navy until 1955”, thus dating the photo to 1955 or after. An undated (circa 1950s?) view of several Navy blimps at Glynco (courtesy of Steve Cruse). A circa 1950s photo of the crew boarding a K-type airship at Glynco. A curious footnote in the history of the Navy's use of Glynco is its 1956 "Master Shore Development Plan". whereas only one runway was ever built for jet aircraft. which was eventually carried out at Oceana NAS & Cecil Field NAS instead. The 1956 USGS topo map depicted Glynco NAS as having 2 blimp hangars & the large paved blimp apron area & mooring pads. 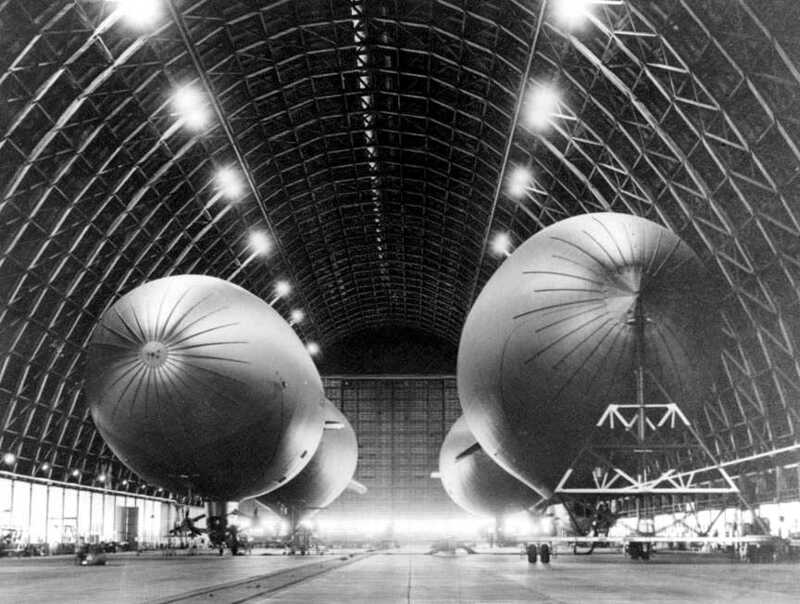 An undated (circa 1956) photo of 4 blimps of Squadron ZP-2 inside Glynco's massive Hangar 1. According to Richard Legg, the photo is “circa 1956 when ZP-2 was replacing the ZSG-3 (3-K) airships with the newer ZS2G-1 (5-K) airships. 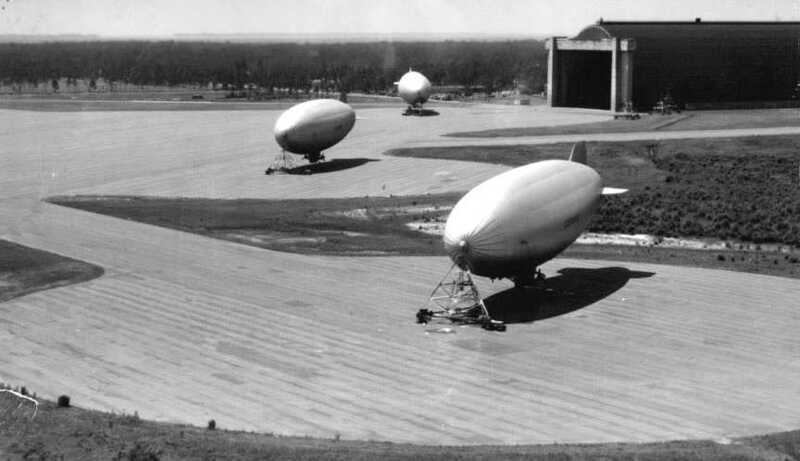 An undated photo of 3 Navy blimps moored to portable mooring masts at Glynco. 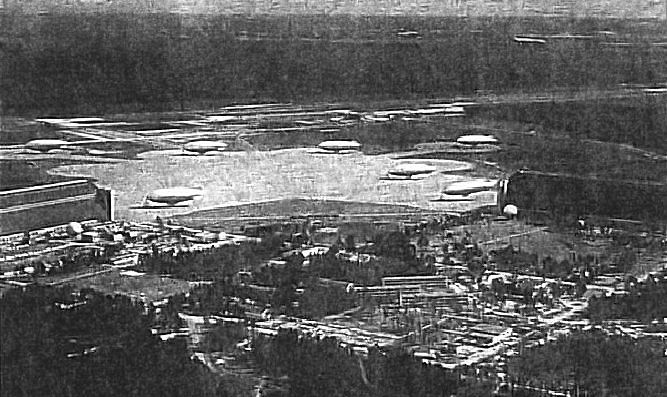 An amazing 1957 aerial view of no less than 7 blimps at Glynco. and jet hangar maintenance was still being performed beneath the airships in Hangar 1. In 1957 I transferred to ZP-2 at NAS Glynco where I was stationed until February 1959. During my years with ZP-2 the squadron was assigned 6 ZS2G-1 (5K) airships & 3 SNB aircraft. Airship pilots were required to be qualified in both LTA (Lighter-Than-Air) & HTA (Heavier-Than-Air) aircraft. The SNB were used for travel to commands located at other locations. NAS Glynco was also the site of the only airship training command. It was at various times identified as ZTG (Airship Training Group) & ZTU (Airship Training Unit). This squadron operated 6 ZSG-4 (4-K) airships during the years that I was there. Basic airship training was provided young airmen after they received their wings as well as other pilots that did not have airship experience. They operated out of Hangar 2. The old diehard LTA officers always referred to them as Dock 1 & Dock 2 vice hangars. While an aircrewman with ZP-2 we often flew to Harris Neck ALF to conduct touch & go landings. 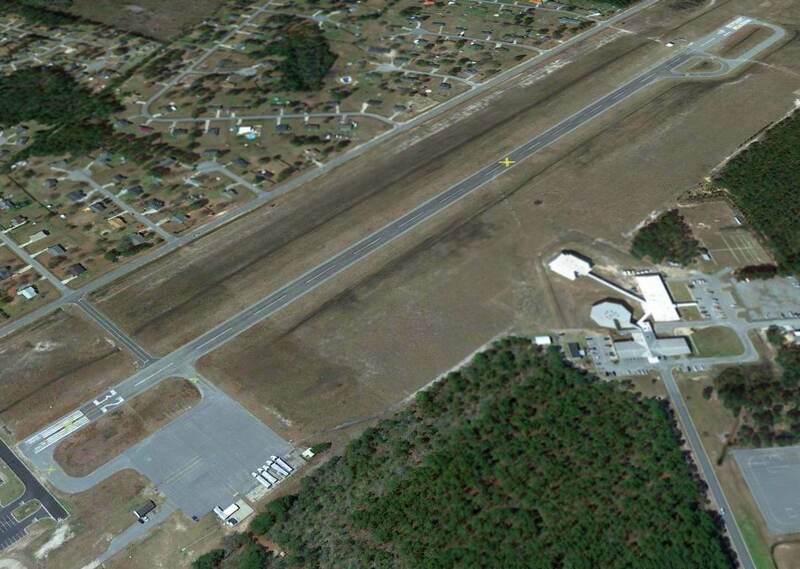 Richard continued, “ZX-11, which was based at NAS Key West, FL, maintained a permanent detachment at NAS Glynco. The detachment was housed in Hangar 1 & all personnel were permanently assigned. Richard Legg recalled, in February 1959, “At that time my sea tour was ended & I crossed the field and was stationed with the Naval CIC School until February 1962. The US Naval Combat Information Center (CIC) School was located at NAS Glynco during the late 1950s & early 1960s. It was a major command that had more than 1,000 enlisted & officers assigned. and 2 hangars located alongside the single 8,000’ runway. The 'T' Building housed all non-aviation components of the CIC School command. 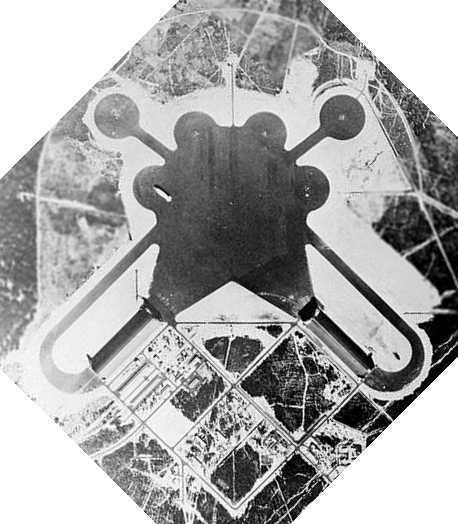 Richard continued, “The second component was the Operations Department that was located alongside the 8,000' runway & next to the base control tower. and one standard hangar containing shop, maintenance, and office spaces. and the other performing maintenance on the assigned jet powered aircraft. The fact that maintenance was assigned to the Operations Department was definitely a non-standard arrangement. The propeller section of the maintenance division was completely independent from the jet division. Richard continued, “The propeller section maintained four WV-2 Super Constellation early warning type aircraft. but leaving the remainder of the aircraft exposed to the elements. The WV-2 aircraft were utilized as in-flight classrooms where Air Traffic Control students were trained in the operation of the radar equipment. Upon successful completion of the course the students would be designated as Air Traffic Controllers (AC) (W). while feeding this same information back to the CIC units in the 'T' Building. The jet section maintained around 90 aircraft. Initially the assigned aircraft consisted mostly of several versions of the F-2H dual-engine Banshees. Around 1960 the older & slower F-2H Banshees were replaced by the newer & more up-to-date FJ-4 Fury. Also a few other aircraft such as T2V & F3D were assigned in limited numbers. 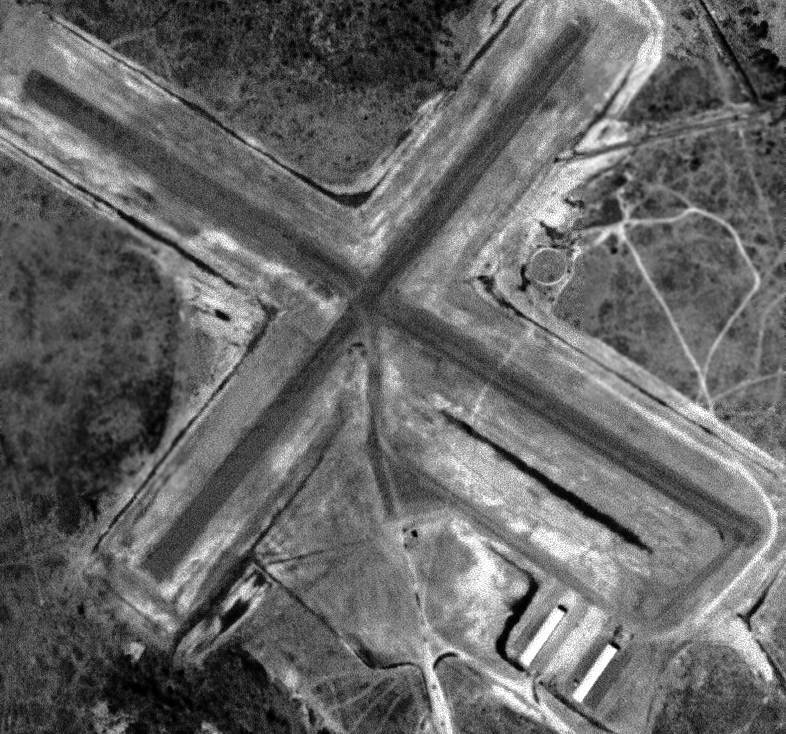 Richard continued, “The CIC jet hangar was probably completed & occupied in late 1957 or early 1958. All maintenance personnel assigned to the Operations Department of the CIC School were reassigned to NAS Glynco in November 1961. Richard continued, “During my years in the CIC School I recall that the station had at least one R4D, one UF & some helicopters. I recall an instance when a pilot assigned to the CIC School flew a jet, prop driven aircraft, seaplane, airship and helicopter in the same day. along with the much smaller 3,800' Runways 5/23 & 13/31, from the original WW2-era airfield. 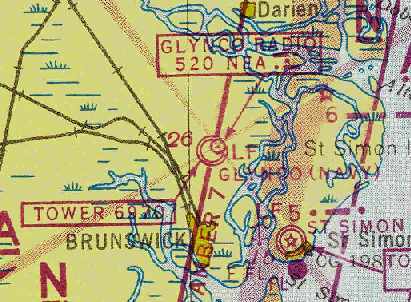 NAS Glynco, as depicted on the 1964 Jacksonville Sectional Chart (courtesy of John Voss). 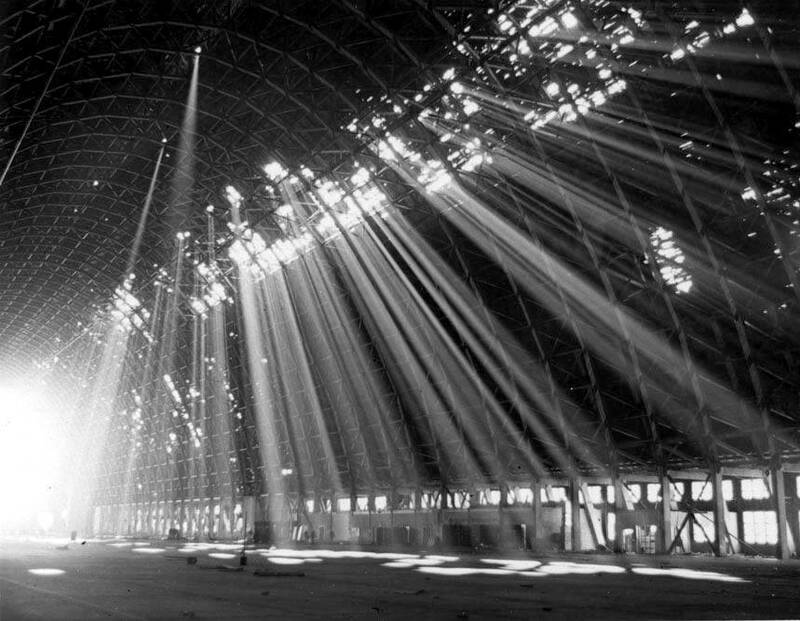 An undated photo showing sunlight poring through several holes in one of Glynco's blimp hangars. 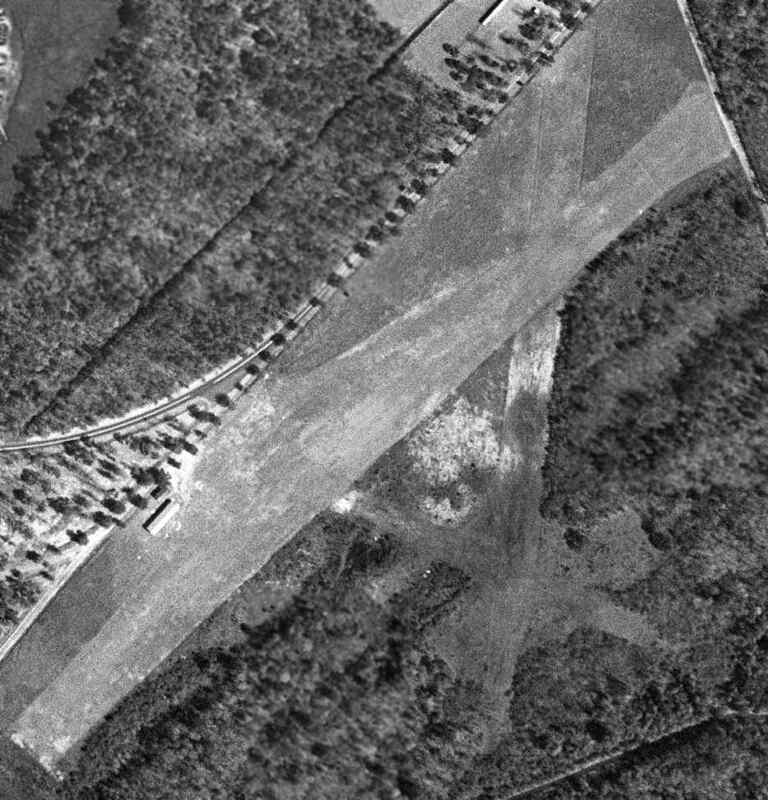 The last aerial photo which has been located showing NAS Glynco in its original WW2 configuration was a 5/1/68 USGS aerial view. Both massive blimp hangars remained, and Runway 13/31 still remained marked over the former blimp mooring mat. Former Runway 5/23 had evidently been abandoned at some point between 1959-68. A 1970 photo by Dan Davis of the 2 hangars at Glynco. 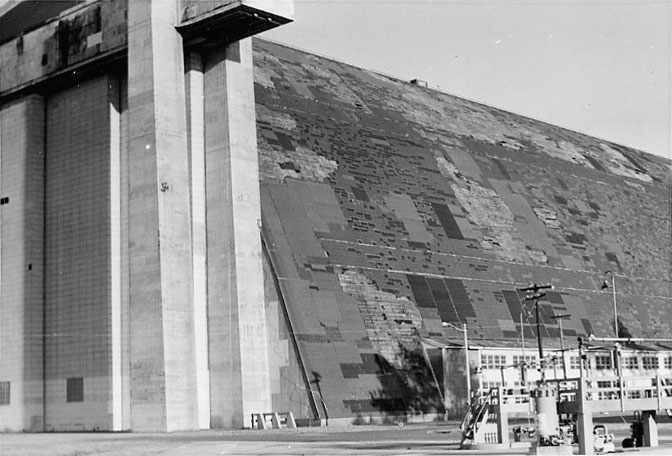 A 1970 close-up by Dan Davis of one of the blimp hangars at Glynco. 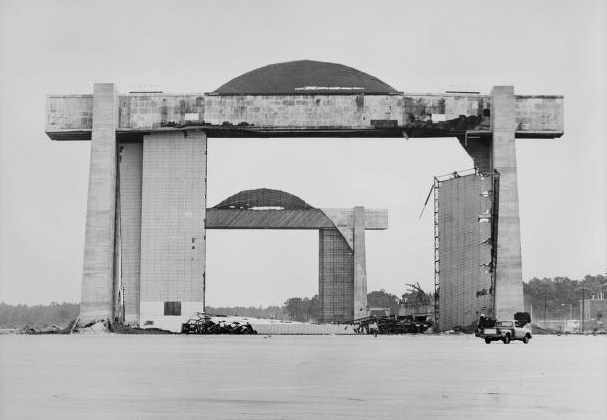 A sad sight for anyone who appreciates our nation's aviation history – the 1971 demolition of Glynco's massive Hangar 2.
taken during its demolition (from the Vanishing Georgia Collection of the Georgia Archives). Both blimp hangars were demolished in 1971.
when they were directed to disestablish the Naval Air Station in 1974.
to the County of Glynn to establish a civil airport. with driver training tracks being built over many of the former blimp mooring pads. Christopher Ness reported in 2003, “I did try to get a good view of the old blimp facility with minimal success. It was neat to see about 30 police cars with lights flashing run the course." of the former southeast/northwest Navy runway at Glynco. A 2014 aerial view looking northwest at the remains of the Glynco blimp field, with the runway of Glynco Jetport in the background. A 1999 Army Corps of Engineers report gives further details of Glynco.